Now that some time has passed, it's time to reflect on the remarkable high school career of Anne Marie Armstrong. It’s hard to put into words just what Anne Marie accomplished while wearing a Wesleyan basketball uniform due to the sheer volume of it. During her time at Wesleyan, Anne Marie became one of the most recognizable figures in Georgia High School basketball and what she meant to Wesleyan's program and to Wesleyan School cannot be denied. Anne Marie benefitted by joining a program that had already won three state titles in the previous four seasons prior to her freshman year. Growing up in Wesleyan's system while playing on the middle school teams, she knew what the expectations were once she started high school. There was a winning tradition already established which she greatly wanted to contribute to. 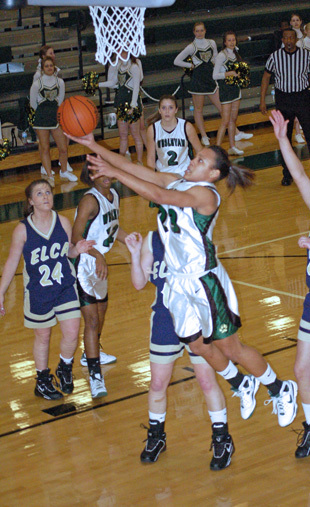 She made an immediate impact her freshman year with her coming out party occurring during the 2005 Deep South Classic in which she had back to back 22-point performances. The local media began asking about this freshman they'd never heard of. It was easy for her to blend in while playing on a team that featured four soon-to-be Division I college players in Carolyn Whitney, Elise Whitney, LeLe LeSeur and Alison Watt. After that Christmas tournament though, she could no longer be hidden. This began a trend that would continue for the next three years as she led the team in scoring in each of the three years following her freshman season. 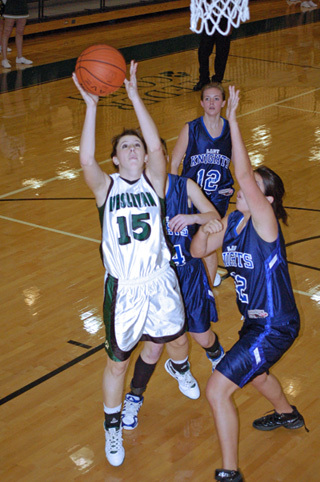 During her four years on the varsity, the Lady Wolves won 87% of their games posting a record of 115-18. Anne Marie played in four straight state championship games winning three of them. Perhaps the most memorable moment of her high school career occurred in the semi-finals of the 2007 AA state tournament in her sophomore year. Wesleyan and undefeated Randolph-Clay were tied at 49. About 30 seconds remained in the game and Wesleyan was working the ball around for a last second shot from the outside as Randolph-Clay’s zone defense was sealing the interior. A Randolph-Clay defender deflected a pass out of bounds, right underneath the Wesleyan basket with 0:01 remaining on the clock. The scoreboard in the Macon Coliseum does not show tenths of seconds so no one knew if that 0:01 was really 1.9 seconds or 1.0 seconds. Coach Azar immediately called time out and set up a play….that had never been run or even practiced before. She designed the play on the fly and the Lady Wolves came out of the timeout and took their places on the floor. Kelly Hall was handed the ball by a referee as the other four Wesleyan players lined up side by side. Hall lobbed the ball in the air, Anne Marie stepped back, Sarah Delk sealed Randolph-Clay's big post player, Anne Marie jumped, caught and released the ball all in one motion. The ball sailed through the hoop touching nothing but net sending the Lady Wolves to an improbable state championship game appearance after graduating five players from the previous season's team that went on to play at the next level. 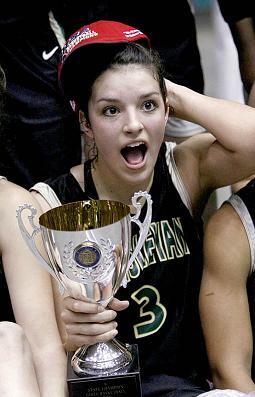 This arguably was the most clutch moment of her high school career. Anne Marie led her team to three state championships, one state runner up finish, two region championships and a national ranking in both the USA Today and ESPN high school polls. She was also twice named Miss Georgia Basketball, twice named National Player of the Year by the National Christian School Athletic Assocation, three time NCSAA All American, Fourth Team Parade All American, won two state player of the year awards for her classification and was named First Team All State her sophomore, junior and senior years among many other honors and awards. 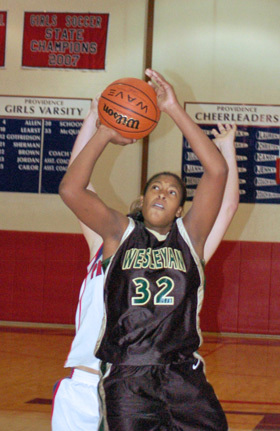 She ended her career as Wesleyan's all-time leader in blocked shots with 216. She's Wesleyan's second all-time leader in scoring and rebounds while scoring 2,128 points and grabbing 820 rebounds respectively. All of these things contributed to Anne Marie receiving a full scholarship to play basketball at the University of Georgia. As impressive as all of these accomplishments and statistics are, her impact is even greater in the influence she had on the younger players in the Wesleyan program who looked to her as a role model much as she looked up to the varsity players when she was in middle school. As phenominal a basketball player as Anne Marie is, she is the consumate all around athlete. Not only was she a memeber of three state championship basketball teams, she led the Wesleyan volleyball team to three state titles and the track team to a team state title her senior year. She won three individual state championships in the high jump her sophomore, junior and senior years graduating with a total of 10 state championships. Remarkable. One would be hard pressed to find a more accomplished all around athlete...especially in the current climate of specialization among high school athletes. We will probably not see the likes of an Anne Marie again. She will be greatly missed but leaves the program in good hands. It was an honor to see her play during these past years. Congratulations to Anne Marie for all of her amazing accomplishments. Best of luck at the next level. We all look forward to watching her for four years at Georgia. Wesleyan senior Aysia McKenzie has accepted a basketball scholarship offer from King College. 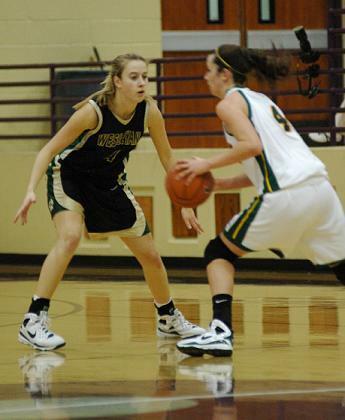 A four-year varsity basketball player, McKenzie is entering her fourth season as Wesleyan's starting point guard. She has helped lead the Lady Wolves to two state basketball championships and a state runner up finish in her three varsity seasons. She joins teammates Erin Hall (Wake Forest) and Logan Morris (Wofford) in committing early to an NCAA basketball program. King is located in Bristol, TN and is an NCAA Division II school. McKenzie accepted King's offer after considering offers ffom Newberry and North Carolina-Pembroke. She becomes the 14th Wesleyan girls player to receive a college scholarship to play basketball. Congratulations Aysia on your college choice! 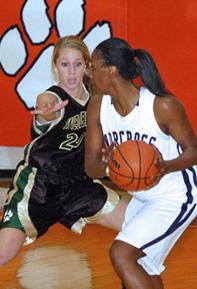 Logan Morris defends vs. Norcross in '08. Wesleyan senior Logan Morris has accepted a basketball scholarship offer from Wofford College. 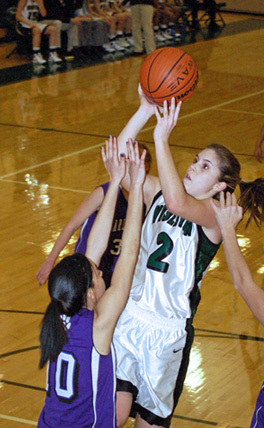 A four-year varsity basketball player, Morris is entering her third season as a starter. She has helped lead the Lady Wolves to two state basketball championships, earning All-Region honors last season, when she averaged 7 points, 3.5 rebounds and 2.5 steals. Morris, who maintains a 3.2 GPA, also was being recruited by the University of Georgia fastpitch softball program as an invited walk-on. 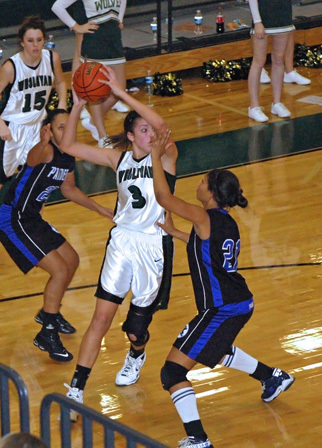 She joins teammate Erin Hall (Wake Forest) in committing early to a Division I basketball program. Wofford, located in Spartanburg, SC, is a member of the Southern Conference whose members include Appalachian State, The Citadel, Elon, Furman, Georgia Southern, Samford, Tennessee-Chattanooga, Western Carolina and College of Charleston. Morris becomes the 13th Wesleyan girls player to receive a college scholarship to play basketball. Below is the complete list of Wesleyan girls basketball scholarship receipients. Congratulations Logan on your college choice! 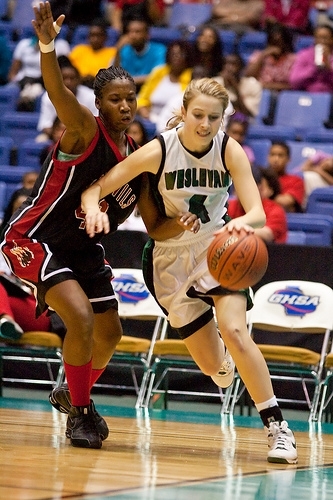 Anne Marie Armstrong finished her Wesleyan career with 2,128 points which ranks her seventh all time in Gwinnett County. She joins 2004 Wesleyan grad Nikki Luckhurst in the top 10. The rise of Wesleyan's girl's basketball program has been meteoric to say the least...six state championships in 12 years of existence. 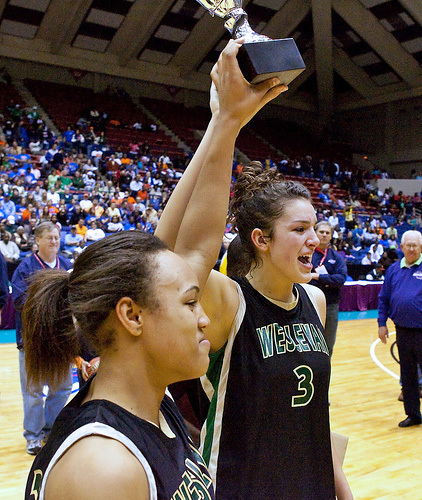 Wesleyan currently ranks tied for fifth in all-time state girls basketball championships won in Georgia history. To give perspective to this accomplishment, the list of all-time girls basketball state championships won is listed below. None have been accumulated as quickly as those won by the Lady Wolves. This is an attestment to the dedication of Coach Azar, her staff and her players throughout the years. Congratulations to all who have been associated with the Wesleyan program over the past 12 years for these outstanding achievements. Wesleyan rising senior Erin Hall has decided to continue her education and basektball career at Wake Forest University. She gave the school a verbal committment last week after gaining attention from several Division I schools including Georgia Tech, Princeton, Vanderbilt, Virginia and Tulane. "My parents and I sat down and went through what I wanted in a college," Hall said in an interview with the Gwinnett Daily Post. "I didn't want to go to a huge school with 100 people in a class. I wanted a smaller school, but one that was still Division I and good with athletics and academically strong, too." The 5-foot-9 senior averaged 14.4 points, 3.7 rebounds, 2.5 assists and 2.3 steals per game last season as Wesleyan went 29-4, won its second straight state title and finished the season ranked No. 35 in the country by ESPN. "It's great for Erin to go this big," Wesleyan coach Jan Azar said. "I think it says a lot about her. I've not seen too many players - boys or girls - who are as good a shooter as she is. Wake's been on her from the beginning. They've gotten to know her and she knows them well. I think it's an excellent fit." Erin will become the first Wesleyan player to receive a basketball scholarship to a school in the Atlantic Coast Conference which is considered one of the top conferences in the country for womens basketball. The Demon Decons are coming off a 21-11 season in which the team earned its second Women's NIT berth in five years. With her verbal commitment to Wake Forest, Erin becomes the 12th Wesleyan girls player to receive a college scholarship to play basketball. Below is the complete list of Wesleyan girls basketball scholarship receipients. Congratulations Erin on your college choice! Anne Marie Armstrong was selected National Player of the Year for the second straight year by the National Christian School Athletic Association last week. She is also a First Team All America selection. Along with Armstrong, Wesleyan teammates Chantel Kennedy and Erin Hall were selected to the Southeast Super Regional Team. NCSAA All-Americans were chosen from among finalists, based on this past season's statistics and achievements; competitive strength of team schedule; level of skill (assessed by submitted video); and other significant factors that were shared during the nomination process. The All-American teams will be featured in an upcoming issue of Passion in Play (the NCSAA magazine), and on the NCSAA web site the list will also be published to the attention of college coaches. Each Player of the Year will be individually featured in Passion in Play and will receive an additional award plaque, to recognize his/her selection. Armstrong's All America selection is her third. She was selected Second Team All American in 2007 and First Team last season making her Wesleyan's first three-time NCSAA All American. Two other Wesleyan players have earned NCSAA All America honors. In 2004, Nikki Luckhurst was named Second Team All America by the NCSAA while Carolyn Whitney was named Third Team All American in 2006. Congratulations to Anne Marie, Chantel and Erin for these honors. 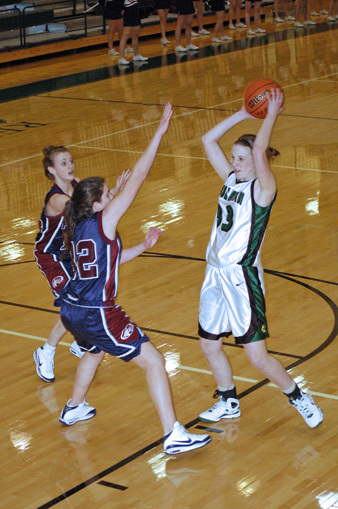 Parade Magazine released it's 2009 All-America High School Girls Basketball Team in April and recent Wesleyan graduate Anne Marie Armstrong was named to the Fourth Team. Armstrong is the first girls basketball player in Wesleyan history to be selected to the Parade All America team. The entire 40-person team is listed below. Congratulations Anne Marie on this prestegious award! The Georgia Athletic Coaches Assocation released its All State teams recently and Anne Marie Armstrong, Chantel Kennedy aand Erin Hall were all selected First Team All State. The entire GACA Class A All State team is listed below. Congratulations to all for this well deserved recognition. 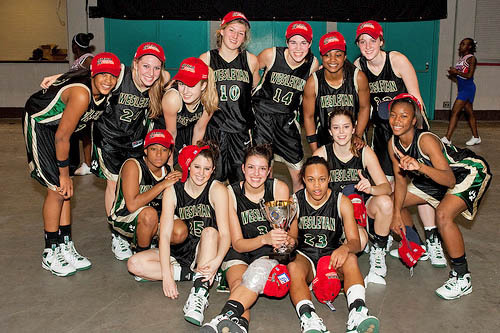 The rise of Wesleyan girls basektball has been meteoric with six state championships in the program's 12-year existence. That's a 50% clip. It's doubtful that any other program, especially in a high profile team sport such as basketball, can boast winning state championships in 50% of its seasons. Coach Jan Azar has been at the helm all 12 of those seasons creating the Wesleyan girls basketball program from scratch starting with the 1997-1998 season. Since then she has amassed six state titles, which groups her with two other coaches, as the the most ever won by a girls basketball coach in Georgia history...regardless of school classification. Norman Carter led the Butler girls to a state title in 1964 before winning five at Taylor County from 1968 to 1972. N.P. Malcom led Seminole County to state titles in 1956, 1959, 1963, 1964, 1965 and 1969. With one more championship Azar would stand alone at the top. Since Wesleyan is currently experiencing this incredible run, it is hard to place perspective on this...but we are in the midst of historical greatness with this run. 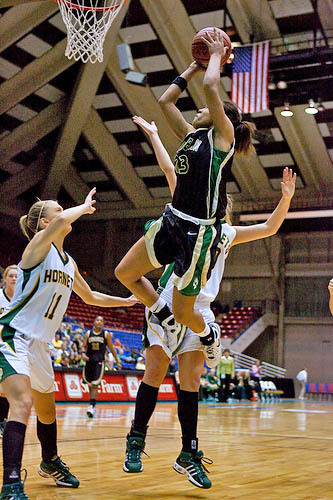 The Georgia High School Association conducted its first girls basketball state tournament in 1945 so there are 65 state tournaments that have been played with multiple classifications. A total of 175 different coaches have won a girls state championship, only 22 have won at least three. This is very exclusive company indeed. Below is the list of coaches in Georgia history who have won three or more state championships during their careers. The Gwinnett Tipoff Club season-end banquet was held Sunday night at Brookwood High School and Wesleyan was well represented. Leading the way was Anne Marie Armstrong as she was named Gwinnett County Player of the Year. Coach Jan Azar earned her sixth Gwinnet County Coach of the Year award. Erin Hall and Chantel Kennedy earned First Team All County honors while Hayley Hughes was Wesleyan's Scholar Athlete award recipient. Lastly, Wesleyan was named Co-Team of the Year for Gwinnett along with AA state champion Buford. Congratulations to every member of the Wesleyan girls basketball team and the entire coaching staff and mangers for all of these accomplishments. The All County Teams are listed below. The Atlanta Journal-Constitution released its All State teams today and the Georgia Sports Writers Association released its All State teams late last week and Wesleyan was well represented. Anne Marie Armstrong and Chantel Kennedy were named First Team All State by the both the AJC and GSWA, while Erin Hall earned Second Team All State Honors by the AJC, and All State Honorable Mention by the GSWA... a clearly less enlightened group of individuals. This is Armstrong's third First Team All State award while Kennedy earned her first. This was Hall's second time earning Second Team All State honors. Coach Jan Azar was named 1A Coach of the Year by both the AJC and GSWA, her sixth time receiving state Coach of theYear honors. Congratulations to all for this well deserved recognition. Wesleyan players occupied 30% of the Gwinnett Daily Post's All County team released last week. Anne Marie Armstrong was selected to the First Team while Chantel Kennedy and Erin Hall earned Second Team honors. Strangely Armstrong, who was named Gatorade Player of the Year and was selected as Miss Georgia Basketball...two awards that recognized her as the top player in the ENTIRE STATE of GEORGIA, was not selected as Gwinnett Player of the Year, an honor she earned last year. According to Google Maps, Gwinnett County is still currently located in Georgia. Just sayin'. Congrats to all. 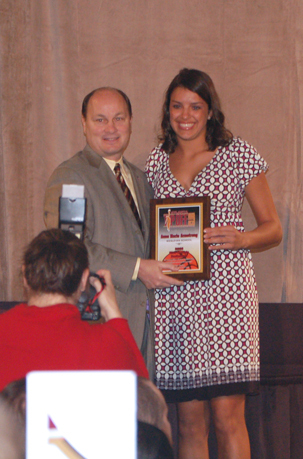 Wesleyan senior Anne Marie Armstrong has again achieved the highest individual honor a basketball player can earn in the state of Georgia as she was recently voted Miss Georgia Basketball for 2009 by the Atlanta Tipoff Club. The Miss Georgia Basketball award recipient is regarded as the most outstanding female basketball player in the state of Georgia regardless all her school's GHSA classification (1A, 2A, 3A, 4A or 5A). Armstrong earned this award behind the strength of her per-game averages of 18.3 points, 6.4 rebounds, 3.9 assists, 2.9 steals and 2.0 blocks. These averages were achieved while playing the latter half of the regular season, and the post-season, on a torn meniscus in her left knee. She also led her team to a 29-4 record, the 1A state championship, a region championship, a No. 35 final ranking in ESPN's season-ending national rankings, and a 7th Place finish in the prestegious Nike Tournament of Champions in Phoenix. This is Armstrong's second straight Miss Georgia Basektball award as she becomes only the fourth player to win the award two times in it's 25-year history, joining Kiesha Brown of Woodward Academy (1995, 1996), Tasha Humphrey of Gainesville (2003, 2004) and Maya Moore of Collins Hill (2006, 2007). Armstrong would be the first to say that this award would not have been possible without being a member of such a deep and talented (and well coached) team. She knows she's not a one-girl gang but it's simply outstanding that her talents and achievments have been recognized in the form of the highest state honor that can be bestowed upon a high school basketball player. Armstrong was recognized at the Atlanta Tipoff Club Naismith Awards Banquet held last night at the Cobb Energy Performing Arts Centre. The all-time list of Miss Georgia Basketball award winners is listed below. Congratulations Anne Marie on this amazing honor! The Atlanta Tipoff Club named Wesleyan junior Erin Hall as a member of the Metro Atlanta Girls Team of the Year, her second such honor, and Coach Jan Azar was named Metro Coach of the Year, her first such honor. The Metro Atlanta Girls Team of the Year recognizes the most outstanding players in the far-reaching metro Atlanta area for the just completed season. Hall posted averages of 14.4 points and 2.3 assists per game and hit a whopping 86 three pointers which ranks second all-time on Wesleyan's list of single-season three pointers made. Caoch Azar led Wesleyan to it's sixth state championship over the last eight years and her team achieved its first ever national ranking being ranked in the pre-season polls by both USA Today and ESPN and finishing the season ranked No. 35 in the country by ESPN. Hall's and Azar's awards were recognized at the Atlanta Tipoff Club Naismith Awards Banquet held Monday night at the Cobb Energy Performing Arts Centre along with the other award winners. The Metro Atlanta Girls Team of the Year honorees are listed below. Congratulations Erin and Coach Azar on these well deserved awards! 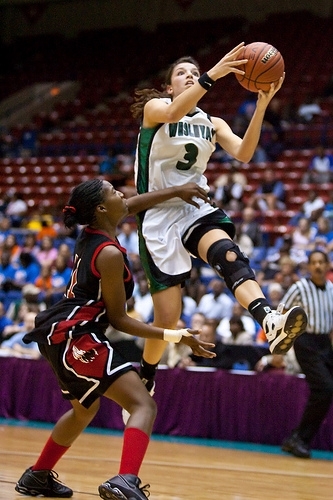 The Lady Wolves won the 2009 Class 1A state championship with a resounding 71-31 thumping of No. 3 ranked Savannah Country Day Saturday afternoon at the Macon Coliseum. Grace Leah Baughn got things started for Wesleyan hitting a three in the first possession of the game. Savannah Country Day, the region 3A champion, came right back with a two on their end and it looked like things might go back and forth. That wasn't the case as the Lady Wolves quickly converted on back to back possessions to open a 7-2 lead just over a minute into the game. The lead then grew to 15-5 at the mid-point of the first quarter prompting a Lady Hornet timeout. Unlike the sluggish first quarter in Wesleyan's semi-final win over Randolph-Clay, Wesleyan took control of this one early closing the first quarter with an 13-0 run to lead 26-5 at the end of one. The sluggishness kicked in the second quarter however. After five minutes of play in the second, Wesleyan had outscored Savannah Country Day 4-3 as the lead was 30-8 at the 2:56 mark. Then a collective light bulb turned on and the Lady Wolves scored 10 points in the final two minutes of the quarter to build a 40-8 lead at the half. Probably the most interesting thing to occur in the second quarter and probably the game was Coach Azar being plowed by a rogue referee. The ref was running down the sideline with his head turned in the opposite direction and ran flat over Coach Azar as she was squatting in front of her team's bench. She got up immediately laughing as the referee apologized and made sure she was ok. A good laugh was had by all....especially the Wesleyan players...and most of Wesleyan's opponent's fans over the past decade. The top ranked Lady Wolves outscored Savannah Country Day 21-13 in the third quarter to take a 61-21 lead into the shortened 6-minute fourth. The teams split the 20 points scored in the quarter 10-10. Game over. Anne Marie Armstrong, who yesterday was named Gatorade Georgia Player of the Year, ended her final game in a Wesleyan uniform with a double-double as she scored 16 points and grabbed 11 rebounds. She also had four assists. 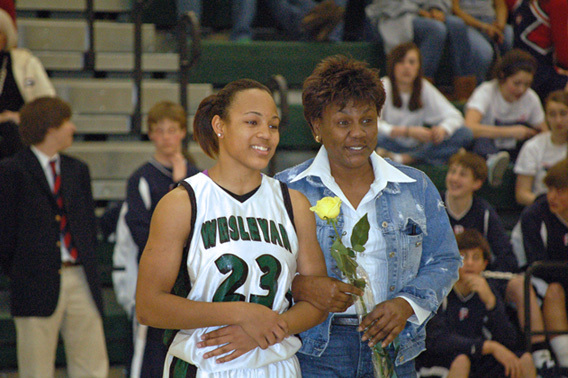 Chantel Kennedy had nine points, six boards and three steals in her final game as a Lady Wolf. Grace Leah Baughn scored 12 points for Wesleyan while Erin Hall added 10 points and three steals. Aysia McKenzie finished with eight points, six assists and two steals while freshman Holli Wilkins had a double seven in points and boards. The Savannah Country Day girls certainly shouldn't hang their heads as they finished their season as state runner up and champions of region 3A and with a 29-4 record. Wesleyan also ends it's season with a 29-4 record. Most impressive is the Lady Wolves' average margin of victory in their state tournament run. Wesleyan outscored it's state tournament opponents by and average score of 80-35. The win also caps as dominant a decade as has ever been seen in Georgia high school basketball history. From 2001 through 2009, Wesleyan has played in eight state championship games winning six. Wesleyan was state runner up in 2001 and 2007 and state champion in 2002, 2004, 2005, 2006, 2008 and now 2009. It's been quite a run and there doesn't appear to be an end in sight. Coach Azar, while already the winningest female head coach in Georgia history, is now tied with two others for most state championships ever won by a girls basketball coach in Georgia history with six. Norman Carter coached six girls teams to state titles at Butler and Taylor County while N.P. Malcom coached Seminole County to six girls state titles during his career. With her six state championships, she is now tied for fourth on the all-time list for basketball titles won by a boys or girls coach in Georgia. Today was the last game for Wesleyan seniors Anne Marie Armstrong and Chantel Kennedy. Armstrong will graduate as the most decorated player in Wesleyan's storied history. More will be written about her in the next few weeks after all of the awards are tallied. She will continue her basketball career at Georgia. Kennedy will continue her basetball career at Colorado State and has grown tremendously both as a player and a person during her time at Wesleyan. Both seniors will be sorely missed by the Wesleyan faithful and we all look forward to following their basketball careers at the next level. Congratulations to the Lady Wolves - 2009 State Champions! 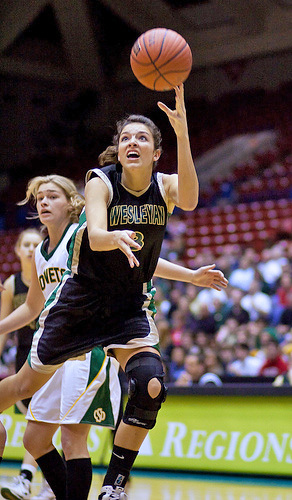 Wesleyan senior forward Anne Marie Armstrong is the Gatorade girls basketball player of the year. The Gatorade player of the year program annually recognizes one winner in the District of Columbia and each of the 50 states. Armstrong averages 18.3 points, 6.4 rebounds, 3.9 assists, 2.9 steals and 2.0 blocks per game for Wesleyan (27-4), which plays at 11 a.m. Saturday in Macon vs. Savannah Country Day for the Class A title. 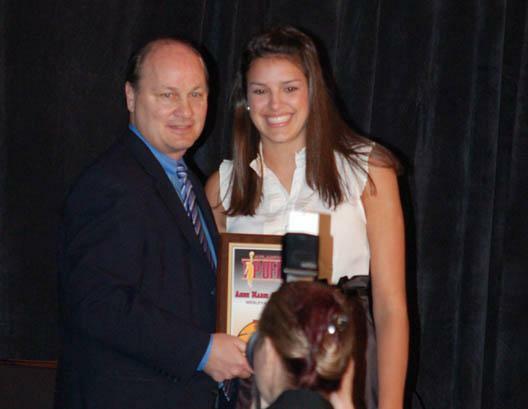 The 6-foot-3 Armstrong was the AJC’s Miss Georgia Basketball as a junior in 2008. She signed with the University of Georgia. Armstrong won state titles with Wesleyan in 2006 and 2008. 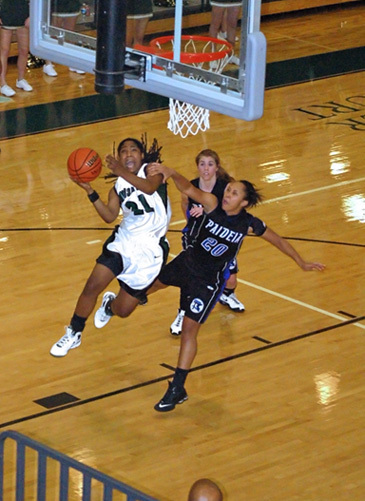 Armstrong joins Alicia Manning (2008, Etowah) and Maya Moore (2006, 2007, Collins Hill) among the state’s list of recent Gatorade girls award winners. The Lady Wolves used the momentum of a big second quarter and cruised past Randolph-Clay 84-59 in the semi-finals of the 1A state tournament Wednesday afternoon at the Macon Coliseum. After sixth ranked Randolph-Clay scored the first two points of the game, Wesleyan scored the next seven. The Lady Red Devils then went on a 10-2 run to take a 12-9 lead with 1:25 left in the first quarter. Erin Hall connected from behind the arc for the third time to tie the game at 12. That was the begining of a 7-0 Wesleyan run to end the first quarter. The No. 1 ranked Lady Wolves led 16-12 at the end of one. Then the second quarter began... The bombs fell from three point range and the wheels fell off for Randolph-Clay. Four Wesleyan players nailed a total of five 3-pointers in the second quarter. The Lady Wolves upped their defensive pressure and blew the game wide open outscoring Randolph-Clay 27-8 in the quarter to take a 43-20 lead at halftime. Wesleyan didn't have the same defensive intensity in the third quarter as was displayed in first half and the athletic Lady Red Devils took advantage as junior Destiny Mitchell scored 14 points in the quarter. Randolph-Clay had closed the Wesleyan lead to 15 at 55-40 with about three minutes to play in the third quarter but a 12-3 Wesleyan run to close out the quarter quickly squashed any hopes Randolph-Clay had of a comeback. As poorly as Wesleyan played defensively in the quarter, Randolph-Clay was simply unable to gain any ground on the deeper Lady Wolves. Wesleyan led 67-45 heading into the fourth quarter. In the fourth, Anne Marie Armstrong began to heat up as she seemed more comfortable on her gimpy knee. She scored eight points in the quarter which is what she had in the first three quarters combined. Wesleyan outscored Randolph-Clay 17-14 in the fourth to produce the 84-59 final score. This was by no means the complete effort that the Lady Wolves produced in their quarterfinal win over Towns County but they still take a 25-point win over a perennial state contender however sloppy it may have been. 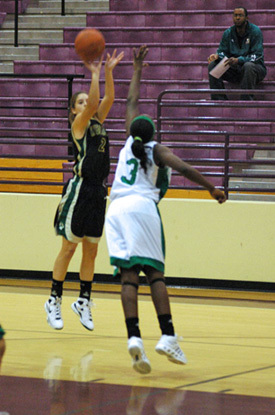 Particularly impressive was the Lady Wolves' sharp shooting from 3-point range. Wesleyan hit 10 threes during the game, eight in the first half and five in the pivotal second quarter when the Lady Wolves built their insurmountable lead. Hall connected on four threes for the game. Grace Leah Baughn had three threes. Logan Morris connected on two while Kennington Groff hit one. 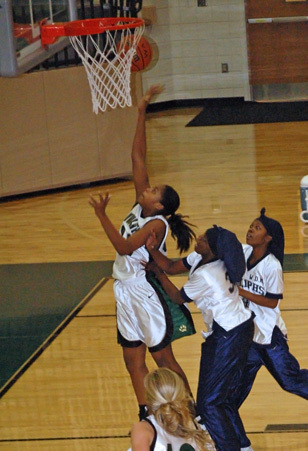 The Lady Wolves had four players score in double figures led by Hall's 18 points. Armstrong finished with 16 points, eight boards, five assists, four steals, and four blocked shots. Baughn scored 15 points for Wesleyan while Logan Morris added 12 points, five rebounds and three steals. Holli Wilkins chipped in eight points. Chantel Kennedy and Groff each scored six points while Aysia McKenzie continued her solid play of late as she scored three points, dished 11 assists and had four steals. This was the third meeting between Wesleyan and Randolph-Clay. All three have occured in the semi-finals of the state tournament with Wesleyan coming out on the winning end in each. Randolph-Clay completes its fine season with a 27-5 record. The win advances Wesleyan to its sixth straight state championship game and eighth state title game over the last nine years. The Lady Wolves improve to 28-4 on the year and are looking to add another state championship to their five state titles and two state runner up finishes over the last nine years. First they'll have to take on fourth ranked Savannah Country Day (29-3), a 68-38 winner over Southwest Atlanta Christian in its semi-final game. This will be the first meeting betwen the schools. Tipoff is Saturday at 11:00 AM in the Macon Coliseum. The game will also be televised on GPTV, PBS Channel 8. Not many teams could roll up 92 points in a 30-minute game and not have one player score 20. That was the case for Wesleyan Saturday afternoon as they completely overwhelmed Towns County 92-36 in their quarterfinal matchup of the 1A State Tournament at Marietta High School. Things started off typically enoungh for top ranked Wesleyan, a quick 2-0 lead from a layup generated by winning the opening tipoff. Then Towns County got going by breaking Wesleyan's press and hitting back to back 3-pointers on consecutive possessions. Towns, the Region 8A champion, was up 7-2 and their large contingent of fans was going crazy. During this time Anne Marie Armstrong was whistled for two quick fouls and sat the remainder of the first quarter. Being down early at the hands of a good team with your top scorer in foul trouble would rattle most teams. This isn't most teams however as all Wesleyan did was lock down on defense while going on a 19-4 run to close out the quarter with a 21-11 lead. The Lady Wolves' defensive pressure in the second quarter was simply stifling as seventh ranked Towns County did not make one field goal in the quarter. Wesleyan outscored the Lady Indians 33-11 in the second as all of Towns' points came from free throws as they shot 15 in the quarter. Wesleyan led 54-22 at halftime. Things picked up in the third quarter where they left off in the second. Towns' next field goal came with 6:55 left in the third quarter. It was their first points not generated by a free throw since the 5:27 mark of the first quarter. Wesleyan held Towns to zero field goals made for close to the eqivilant of two entire quarters. Remarkable. The Wesleyan lead grew to 75-31 entering the fourth quarter and the Lady Wolves outscored Towns 16-5 in the 6-minute fourth as seven different players scored in the period. This game was a complete team effort as 12 of the 13 players on Wesleyan's roster scored. One of the most noticible events in the game was the Lady Wolves dominance of the glass. Wesleyan grabbed a whopping 66 rebounds in the game. Add 32 steals and it's a recipe for a big win deep in the state tournament. Four players scored in double figures led by Erin Hall's 18 points and eight rebounds. Kennington Groff was all over the floor tonight as she scored 14 points and had five steals. Chantel Kennedy chalked up a double-double scoring 13 points while grabbing 14 boards. She also had five steals and four assists. Holli Wilkins scored 11 points and pulled down five rebounds. Logan Morris had nine points while Grace Leah Baughn scored seven. Despite very limited action due to foul trouble, Armstrong still contributed scoring four points. She was the team's second leading rebounder with nine. She also had five assists and was a huge leader from the bench constantly encouraging her teammates. Another tidbit worth noting is that Wesleyan put up these points against a good, disciplined team, while only making two 3-pointers. All in all this was probably the most concise game Wesleyan has played this year especially on the defensive end. They held Towns County to just 9 of 44 shooting (20.5 percent). The defense dictated much of the offense all night. As quoted in the Gwinnett Daily Post, "Of all the games we've played this season, I'm most proud of how hard we played in this one," said Wesleyan girls coach Jan Azar. "Every single person who went in contributed in some way. That was a fun game because we did not stop (with effort)." Towns County ends its fine season with a record of 25-6 while Wesleyan improves to 27-4. With the win, Wesleyan advances to its sixth straight trip to the Final Four in Macon and it's eighth trip to the Final Four in the last nine years. The Lady Wolves semi-final opponent will be a familar one, Region 1A champion Randolph-Clay (27-4). The two teams have met twice before, both times in the semi finals of the state tournament. Wesleyan defeated Randolph-Clay 61-53 in the 2004 2A semi-finals and 51-49 in the 2007 2A semi-finals on a inbounds lob to then sophomore Armstrong at the buzzer. Should be a good one. Tipoff is Wednesday, March 11 at 4:00 PM in the Macon Coliseum. Wesleyan started off sloppy but finshed strong as they manhandled Darlington in an 80-32 win in the second round of the 1A state tournament Tuesday night at Wesleyan. The Lady Wolves were a little out of sorts for the first five minutes of the game leading 14-8 at the 2:30 mark of the first quarter. Wesleyan then went on a 14-0 run to close out the first quarter and a six-point lead balooned to a 20-point lead as the Lady Wolves took a 28-8 lead into the second quarter. Wesleyan then took in up a notch in the second outscoring Darlington 21-3 in the period to open a 49-11 halftime advantage. The Lady Wolves outscored Darlington 19-11 in the third quarter and led 68-22 heading into the shortened, six minute foruth. All Wesleyan players saw plenty of action in this last home game of the season. Anne Marie Armstrong did not disappoint the home crowd in the last home game of her career. She scored 19 points, pulled down 13 rebounds, had three steals, and three blocked shots. Erin Hall also scored 19 points while grabbing six boards and four steals. Chantel Kennedy added six points and seven rebounds while Holli Wilkins chipped in nine points and six boards. With the win Wesleyan advances to its ninth straigh appearance in the Elite Eight round of the state tournament. The Lady Wolves improved their record to 26-4 on the year and will face Towns County (25-5) in the quarterfinals. Towns County, the Region 8A champion, defeated Bremen 60-36 in it's second round game. Tipoff is 4:00 PM Saturday at Marietta High School. The winner will advance to the Final Four in Macon. Tonight's win is also significant in that it was the last game in Yancey Gymnasiusm in the careers of seniors Armstrong and Kennedy. We will miss seeing them grace the home court on Wesleyan's campus but look forward to seeing them play at least one more game in Wesleyan uniforms and hopefully two more after that. Wesleyan began its ninth straight state tournament appearance with a resounding 74-19 win over Athens Christian Friday night at Wesleyan. The Lady Wolves opened up a four touchdown lead as the score was 28-0 at the end of the first quarter. Wesleyan led 39-0 before Athens Christian, the No. 4 seed from region 8A, got on the board. Wesleyan led 65-9 after playing a six-minute third quarter. Everyone saw plenty of playing time in this one. The highlight of the evening, other than securing a spot in the Sweet 16, was junior Erin Hall scoring her 1000th career point. She becomes seventh player in Wesleyan's 12-year history to reach the 1000 point plateau. Congratulations to Erin on reaching this very impressive career milestone. Hall and Chantel Kennedy led the scoring for Wesleyan with 15 points apiece while Kennedy also five rebounds and four steals. Grace Leah Baughn had 11 points, six boards and three steals. Logan Morris added nine points for Wesleyan while Anne Marie Armstrong scored six points, had six rebounds, three assists and five blocked shots. The Lady Wolves are now 25-4 on the season with the win. Wesleyan advances to the Sweet 16 round and will face Darlington, a 51-41 winner over Walker in its state tournament opener. The game will take place at Wesleyan this Tuesday, March 3rd. Tipoff time to be announced. It was hardly a work of art, more like a work of abstract art but they'll take it. Wesleyan defeated Paideia 56-31 to win the Region 7A tournament Saturday night at Wesleyan, the Lady Wolves first region championship since winning the 8AA crown in 2006. Wesleyan began the game ice cold converting only 3 of 17 shots in the first quarter and trailed 12-9 at the end of one. Paideia had a good deal of success breaking Wesleyan's press in the first quarter. That changed dramatically in the second due to two factors, the Lady Pythons became fatigued and Wesleyan started applying pressure as designed. This made a big difference in the second. Wesleyan converted numerous turnovers into points in the quarter and outscored Paideia 18-5 in the period to seize control. The Lady Wolves led 27-17 at the break. Things got sloppy again in the third quarter as Paideia continued slowing things down. Wesleyan outscored Paideia 9-8 in the turnover riddled period to take a 36-25 lead into the fourth. The Lady Wolves opened the fourth quarter with an 8-0 run to take a 44-25 lead with 5:55 to play and put the game on ice. Chantel Kennedy led Wesleyan's effort with 15 points, eight rebounds and four steals. Erin Hall scored 11 points while Holli Wilkins came off the bench to score 10. Anne Marie Armstrong saw action for the first time in two weeks while nursing a sore knee. She played in spurts but her contributions were still significant as she scored 11 points while grabbing six boards. The win was ugly as the team looked sloppy at times but did have its bright moments. After a frankly unwatchable first quarter, the Lady Wolves held Paideia to 20% shooting from the field in the final three quarters. Paideia only converted on 6 of 29 attempts from the field in the second, third and fourth quarters. With the win Wesleyan improves its record to 24-4 overall, 15-0 against region oppoents while Paideia falls to 18-10, 13-2. As region champions, Wesleyan earns the No. 1 seed out of Region 7A and will host its first round game of the state tournament. The Lady Wolves will face Athens Christian, the No. 4 seed from Region 8A this Friday at Wesleyan. Game time yet to be determined. Congratulations Lady Wolves - Region Champions. Erin Hall scored 24 points and Chantel Kennedy added 22 as Wesleyan had no trouble with Eagle's Landing Christian in a 87-34 semi-final win in the Region 7A Tournament at Wesleyan Friday night. Hall hit four first quarter three pointers and had six for the game. 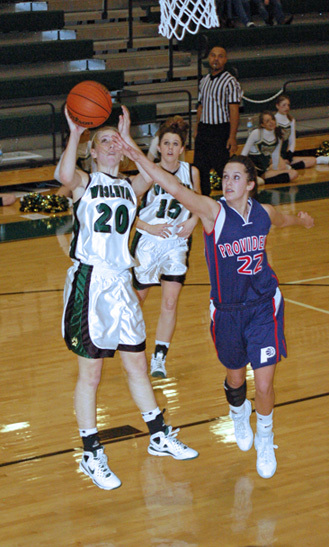 Kennington Groff scored 13 points for Wesleyan while Holli Wilkins added 10. The Lady Wolves improve to 23-4 on the season with the win and will face Paideia tomorrow night in the region tournament championship game. Paideia, (18-9) defeated Providence 45-23 in its semi-final game. Championship game tipoff is 6:00 PM at Wesleyan. Erin Hall scored 21 points as Wesleyan defeated WD Mohammed 83-10 Wednesday night in a first round matchup in the Region 7A Tournament at Wesleyan. Kennington Groff and Holli Wilkins each scored 11. The Lady Wolves improve their record to 22-4 with the victory and will next face Eagle's Landing Christian (14-12), a 53-47 winner over St. Francis, in the semi-finals Friday at 6:00 PM. Tonight's win assures Wesleyan its ninth straight trip to the state tournament. Why are Wesleyan's varsity teams so successful year-in year-out? Look at the younger teams in the program. The Wesleyan JV, 8th grade and 7th grade teams each completed their respective seasons last week and the three teams combined for a 58-4 record. The JV finished its season undefeated posting a 16-0 record and a 33-point average margin of victory. The 8th grade team completed its season with a record of 23-1 and won 23 in a row after dropping its first game of the season. They outscored their opponents by an average of 31 points per game and were champions of the 8th grade league. Finally the 7th grade team finished its season 19-3 and were runner up in their league. They outscored their opponents by an average margin of 16 points per game. Congratulations to all three teams on their successful seasons. 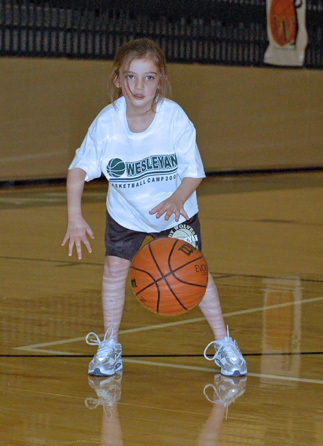 The future of Wesleyan girls basketball is in good hands. Wesleyan finished the regular season with a 77-19 region win over Mt. Pisgah Friday night at Wesleyan. The Lady Wolves scored the first 12 points of the game with four straight three pointers, the first three from Erin Hall and the next one from Chantel Kennedy. That was pretty much all she wrote. Kennedy led all scorers with 23 points while Hall finished with 20. The Lady Wolves complete the regular season with a 21-4 overall record and a perfect 12-0 record in region play. Up next is the Region 7-A tournament which will be hosted by Wesleyan. The Lady Wolves will play on Wednesday, opponent and game time to be determined. Chantel Kennedy scored 19 and Erin Hall 17 as Wesleyan routed Providence 73-23 in a region game Friday night at Wesleyan. Hall had five 3-pointers for the Lady Wolves, who led 26-4 after the first quarter, 48-10 at halftime and 67-15 going into the fourth quarter. Logan Morris was the third double-figure scorer with 12 points. Grace Leah Baughn added seven points for Wesleyan. With the win, the Lady Wolves improve to 20-4, 11-0 in region play. Providence falls to 14-9 overall, 6-4 in region. 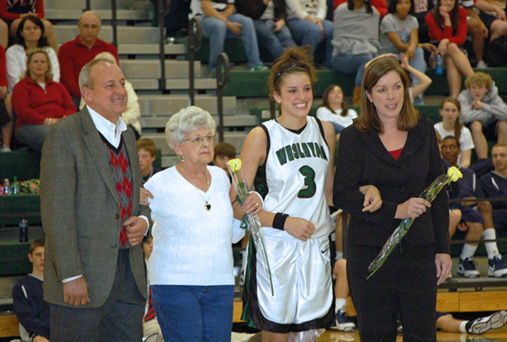 Tonight was Winter Sports Senior Night and Wesleyan seniors Anne Marie Armstrong and Chantel Kennedy were honored. Each player walked to center court with her parents while the PA announcer cited their accomplishments respectively. Anne Marie and Chantel will both be greatly missed after they graduate this Spring...but there is still a lot of basketball left to play until then. Congratulations to Anne Marie and Chantel. Erin Hall scored 22 points and Chantel Kennedy 21 as Wesleyan bounced back from a tough loss Saturday night. 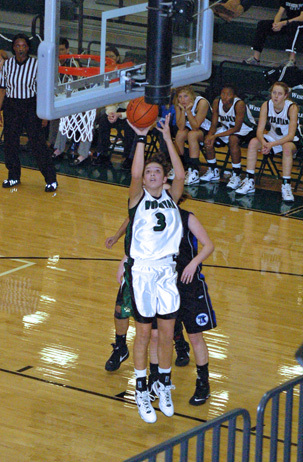 The Lady Wolves picked up an 88-22 road region win at St. Francis Tuesday night. Most of the damage was done in the first half as Hall connected five times from behind the arc in the first quarter. I'm not sure but I would think this would be a school record for most three pointers in a quarter. Kennedy then took the baton from Hall as she scored 15 second quarter points. Kennedy was 7 for 8 from the free throw line for the game. Grace Leah Baughn and Kennington Groff each scored nine points for Wesleyan while Logan Morris chipped in seven. Holli Wilkins added six points while Hayley Hughes scored five. Rounding out the scoring output for the Lady Wolves were Nyaa Davis, Grace Cowart and Megan Coole who scored four, three and two points respectively. Wesleyan improves to 19-4, 10-0 in region with the win. The Lady Wolves will next face Providence at home on Friday at 7:00 PM. Friday is Senior Night where seniors Anne Marie Armstrong and Chantel Kennedy will be honored along with all of the other Winter sports athletes. 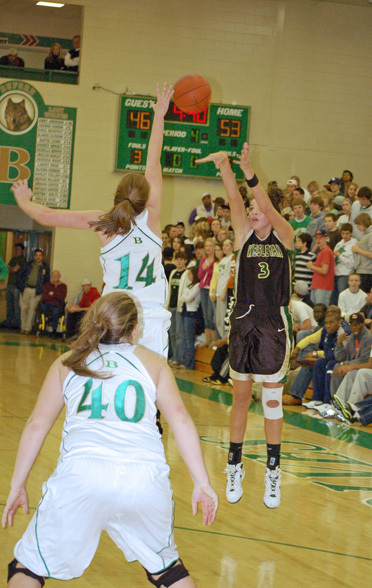 The last time Buford beat Wesleyan in girls basketball, Clinton was president, the Braves were in the middle of their 14-year run of division titles and Falcons quarterback Matt Ryan was a 14 year old middle schooler. That was February 10, 2000. Since then Wesleyan had won 22 straight games against Buford teams both very good and some not so good. Wesleyan's nine-year, 22 game winning streak against Buford came to a halt Saturday night as Buford pulled away late turning a four point lead heading into the fourth quarter into a 76-57 victory...mostly streching the lead courtesy of free throws in the last four minutes. The game was tight for three and a half quarters as Buford led 29-28 at halftime. Anne Marie Armstrong was whistled for two quick fouls in the second quarter and had to sit the remainder of the the quarter at around the 6:00 minute mark. Wesleyan took a 35-33 lead with 4:51 to go on the third quarter but a surprising charge called on Aysia McKenzie when she made the basket created a five point turn around. Instead of Wesleyan leading 37-33 with a potential three point play awaiting, the basket was nullified and Buford scored on the other end tying the game at 35. Wesleyan did not lead again as Buford took a 47-43 lead into the fourth. Wesleyan simply couldn't overcome the foul trouble that plagued them throughout the game, never allowing them into any rhythm. Four Wesleyan players fouled out in this game as Buford enjoyed a 38-13 advantage in free throw attempts. As quoted by the Gwinnett Daily Post, "It's hard to overlook that discrepancy," Wesleyan head coach Jan Azar said. "I love the way both teams go at it but they were allowed to go at it more than we were. Having to sit that many kids affects us when they get in foul trouble." Wesleyan was in striking distance but Buford got it's first 10 point lead 56-46, after a three pointer with four minutes to go. Wesleyan cut the lead to 56-48 with 3:56 left but couldn't get any closer. "I think we didn't come to play the way we needed to play tonight against Buford," Azar said. "They played together and a lot harder than we did." Armstrong led all scorers with 25 points. Chantel Kennedy and Logan Morris scored 10 points each. The biggest difference maker in the game was freshman Andraya Carter who was Buford's leading scorer with 21 points. She often drew double teams and was able to pass it to an open player. 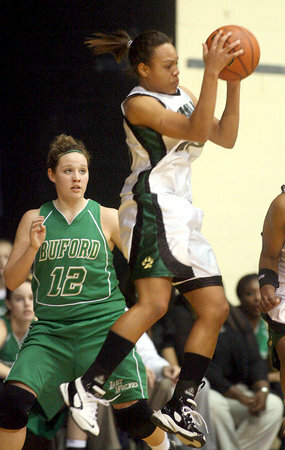 This is a weapon Buford has not had before and she made a difference to Buford's senior-laden team. Buford, ranked No. 1 in 2A, improves to 18-1 on the year while Wesleyan falls to 18-4. Wesleyan now possesses a 22-6 win-loss record all-time vs. Buford. The game atmosphere was superb and really makes one miss playing these games when they possess region or state implications as they did prior to this season. Wesleyan looks forward to the next time they will face off with Buford next season. Wesleyan will next face St. Francis on the road on Tuesday at 6:00 PM. 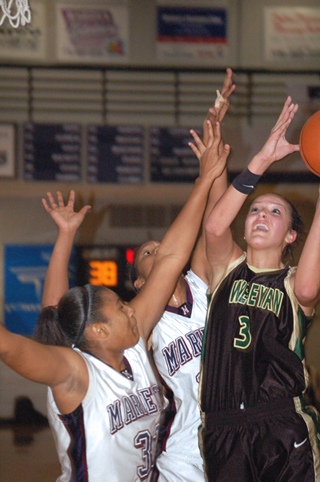 Wesleyan won it's 11th straight game Friday night with an 82-20 region win over Fellowship Christian at Wesleyan. 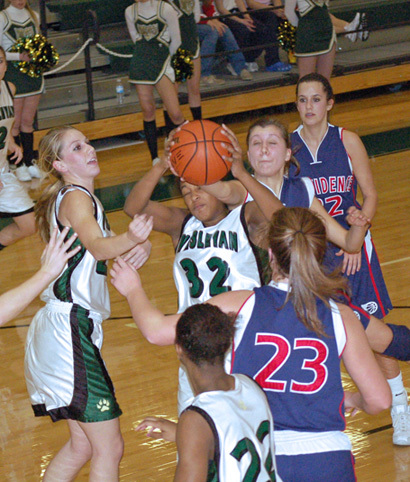 Erin Hall led the Lady Wolves' scoring effort with 19 points. Anne Marie Armstrong scored 18 points while Grace Leah Baughn scored 11 and Chantel Kennedy 10. Holli Wilkins added eight points for Wesleyan while Kennington Groff and Logan Morris chipped in six apiece. Wesleyan improves to 18-3 overall, 9-0 in region. The Lady Wolves will next face those other Lady Wolves of Buford tomorrow night at Buford. This is the first meeting between Wesleyan and Buford that won't have any region or state implications. The two schools had been in the same region for ten years but are now in different classifications. Buford is riding its own 16-game winning streak and is sitting in the position that was Wesleyan's domain for most of the past six years, ranked No. 1 in AA. It should be a fun and hard fought battle between two No. 1 ranked teams. Tipoff is 6:00 PM. Anne Marie Armstrong scored the 2000th point of her career on her 18th birthday and Wesleyan rolled to a 68-56 win over Gainesville, ranked No. 9 in AAA, Saturday night at Wesleyan. The Lady Wolves jumped out to a 9-2 lead before Gainesville went on a 9-3 run to cut the lead to one at 12-11 in the early going. Wesleyan then finished the first quarter on a 12-2 run to open a 24-13 lead heading into the second quarter. Wesleyan led 31-17 midway through the third quarter when things began to get a little sloppy defensively. Gainesville capitalized on Wesleyan's defensive stuggles drawing numerous fouls. This resulted in many successfully converted free throw opportunities which enabled them to cut the led to ten at halftime as Wesleyan led 42-32 at the break. Wesleyan quickly increased its lead to begin the second half starting the half on a 6-0 run. In a game consisiting of scoring streaks for both teams, Gainesville countered to close the lead back to 12 at 48-36. The third and fourth quarters mirrored each other as the Lady Wolves would gain an 18 or 16-point advantage only to have Gainesville cut it to 12 or 10. Gainesville was never able to get the lead under 10 after the initital first quarter spurt that got the Wesleyan lead to double digits and never truly threatened in the entirety of the game. The highlight of the evening was Armstrong's milestone point which was achieved during the second quarter. After she scored what were her 2000th and 2001st career points on a nice bank shot from the left side of the basket, Coach Azar called timeout and the achievement was acknowledged by the PA announcer. Armstrong becomes only the second player in Wesleyan history to reach this rare career scoring milestone. 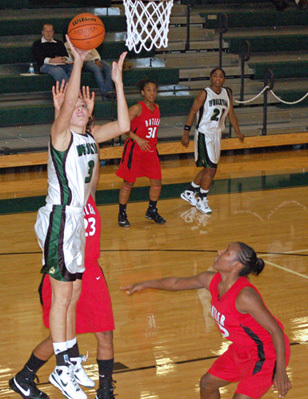 Nikki Luckhurst, who played between 2000-2004, finished her career with 2,393 points. Unfortunately, Armstrong finished the night fouling out on her birthday with about three minutes left in the game but with Wesleyan enjoying a double-digit lead. She completed the evening with 17 points and five assists. Erin Hall and Logan Morris each scored 12 points in the win while Chantel Kennedy just missed a double-double as she scored 10 points, had nine rebounds and five assists. With the win Wesleyan improves to 17-3 on the season as has won 10 straight. The Lady Wolves will next face Fellowship Christian in a region matchup on Friday at 7:00 PM at Wesleyan. Mt. Pisgah scored the first point of the game, Wesleyan scored the next 37. 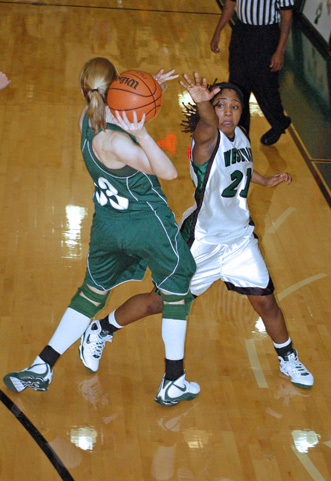 The Lady Wolves efficiently took care of business Friday night in a 76-12 region win at Mt. Pisgah in the first ever meeting between the schools. Wesleyan's press only lasted the first four minutes of the game as a half court defense was on display for the remainder. Wesleyan led 37-1 at the end of the first quarter and 56-6 at halftime. 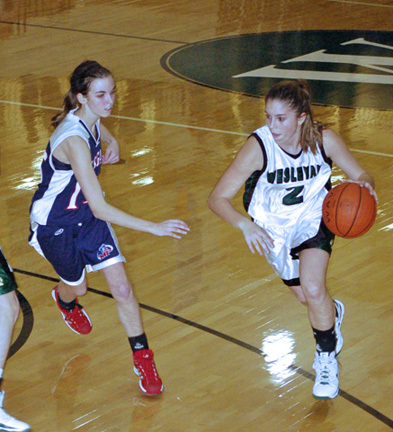 The Lady Wolves won the second half 20-6 as both the third and fourth quarters were reduced to six minutes. Every Wesleyan player saw plenty of playing time and most every player scored. Anne Marie Armstrong barely missed a double-double as she scored 16 points and had nine assists. Erin Hall scored 10 points while Chantel Kennedy, Holli Wilkins and Nyaa Davis each scored nine. Grace Leah Baughn added seven points while Jordan Frazier scored six and Grace Cowart five. Wesleyan is now 16-3 overall, 8-0 in region. The Lady Wolves will next face Gainesville, ranked No. 9 in AAA. Tipoff is tomorrow night at 6:00 at Wesleyan. Wesleyan relied on its relentless defense to create its offense and blew past Class 5A Milton 76-50 in the second session of the Peachstate Battle of the Southeast at Greater Atlanta Christian Saturday afternoon. The first session of the Peachstate Battle was held at Wesleyan December 5th. In a fun game where the Lady Wolves were able to play all-out, Milton kept things close in the first quarter. Erin Hall provided the offensive energy in the quarter scoring 10 points as Wesleyan led 16-11 after one. Milton hung tough in the second quarter behind the efforts of Kris Puthoff-King as she scored eight points in the quarter and did a nice job penetrating. Still Wesleyan outscored the Lady Eagles 19-13 in the quarter to take a 35-24 lead into the locker room at halftime. Wesleyan started the second half on a 7-0 run as the lead grew to 41-24. Wesleyan did a nice job defensively on Puthoff-King in the second half holding her to just two points in the third quarter and four, all free throws, in the fourth. The Lady Wolves outscored Milton 21-7 in the third to take an insurmountable 56-31 lead into the fourth. Wesleyan won that quarter as well outscoring Milton 20-19 in the period. As good as Wesleyan's trademark defense has been this year, tonight's game might have been its best defenisve effort against a high quality opponent. The Lady Wolves did a nice job trapping in their signature press which forced the Milton guards into a slew of turnovers. It was nice to see such a collective effort on the defensive side of the ball for 32 minutes. Heck, it was just nice to be able play for 32 mintues. 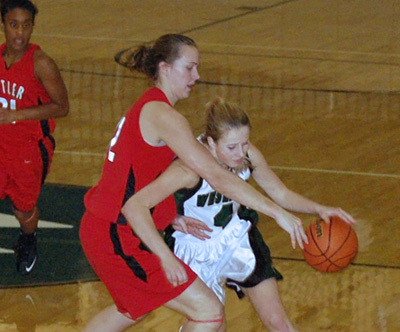 Hall and Anne Marie Armstrong shared high scorer honors for Wesleyan as each scored 19 points. Hall also had seven steals and seven rebounds. Armstrong grabbed eight boards and had seven assists. Puthoff-King led all scorers with 21. No other Milton player scored in double figures. Logan Morris added 12 points for Wesleyan while Kennington Groff chipped in nine. Chantel Kennedy had a game high nine rebounds to go with her seven steals and five points. The Lady Wolves had an impressive 26 steals for the game collectively. With the win Wesleyan improves to 15-3 on the year while Milton's eight game winning streak comes to a halt. Milton drops to 13-3 on the season with its first loss since December 12th. Wesleyan will next make the short trip to the intersection of Old Alabama and Haynes Bridge to face Mt. Pisgah for the very first time in a region contest. Tipoff is 6:00 PM this Friday. Wesleyan put up a large number in the first quarter and coasted to an 89-27 region win over St. Francis Tuesday night at Wesleyan in the first meeting between the two schools in nine years. Wesleyan won that one 73-15 on January 21, 2000 as we have now come full circle. The Lady Wolves took a 35-3 lead at the end of one and led 79-20 heading into the fourth. The third and fourth quarters were both reduced to six minutes...again. Anne Marie Armstrong led all scorers with 26 points. Erin Hall added 16 for Wesleyan while Chantel Kennedy scored 12 points and had six assists and six steals.. Aysia McKenzie scored eight points and dished eight assists. The Lady Wolves are now 14-3 overall, 7-0 in region. Wesleyan will next face Milton on Saturday in the Peachstate Battle of the Southeast at Greater Atlanta Christian. Tipoff is 3:40 PM. As they did with Paideia earlier in the week, Wesleyan allowed an opponent to hang around for a quarter before deciding to get serious and get after it. The Lady Wolves played extremely poorly and out of synch in the first quarter but righted the ship and cruised to an 86-37 win over Westminster Satruday night at Wesleyan. The first quarter was a comedy of errors that included many missed layups, sloppy turnovers and a lack of execution on defense. Despite all of the ugliness, Wesleyan led 13-10 at the end of the first. The second quarter continued the sloppy trend until about midway through the quarter when a collective light seemed to turn on with the Wesleyan players. Within a matter of 10 seconds, Wesleyan scored eight points off a series of steals. The Lady Wolves outscored Westmister 31-13 in the period behind a 17-point second quarter effort by Anne Marie Armstrong. Wesleyan led 44-23 at halftime. As bad as the Lady Wolves looked in the first 1 1/2 quarters is as good as they looked the rest of the way. Wesleyan won the third quarter 30-10 and outscored Westminster 12-4 in the shortened six-minute fourth. Armstrong led all scorers with 34 points. Erin Hall scored 17 points while nailing four three-pointers. Grace Leah Baughn and Kennington Groff each scored nine points. Groff was a perfect 4 for 4 from the free throw line. Logan Morris added five points for Wesleyan while Grace Cowart chipped in four. Wesleyan is now 3-0 versus Westminster all time having won the first meeting 58-51 on in December 2004 at the Cobb Civic Center and 56-39 in the second meeting in December 2006 in the finals of the Westminster Holiday Classic at Westminster. The Lady Wolves improve to 13-3 on the season with the victory. After the game Wesleyan's first Circle of Honor inductees were honored and an original Lady Wolf was among the four inductees. Dana Birnie was inducted into Wesleyan's Circle of Honor being recognized as one of the greatest atheltes the school has produced and a trail blazer for all the female athletes who have come through Wesleyan's girls basketball progam since. 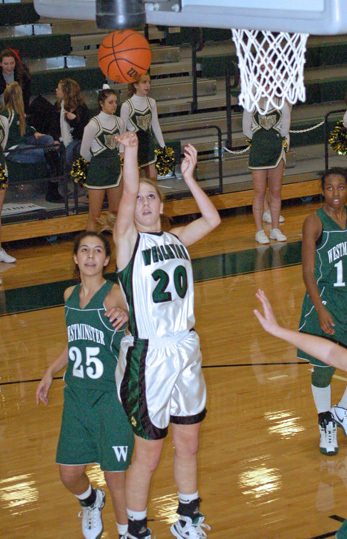 Dana was a member of Wesleyan's inaugural girls basketball team in 1997-1998. 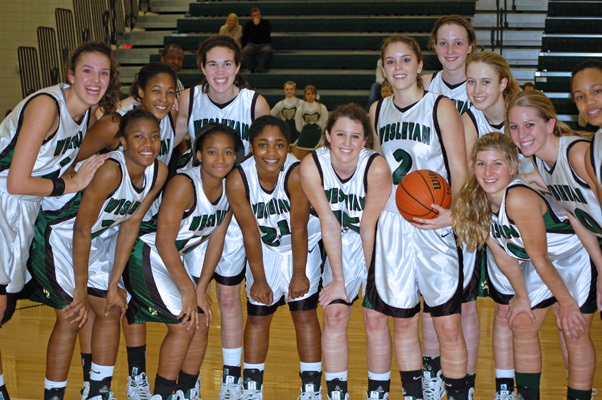 That very first team finished with a 4-16 record, the only losing record a Wesleyan girls team has ever had. Dana however, grew with the program as she went from being a 5'1 guard on a 4-win team her freshman year to a 6'1 guard on a 31-win team her senior year. That team fell a heartbreaking four points short of a state championship. 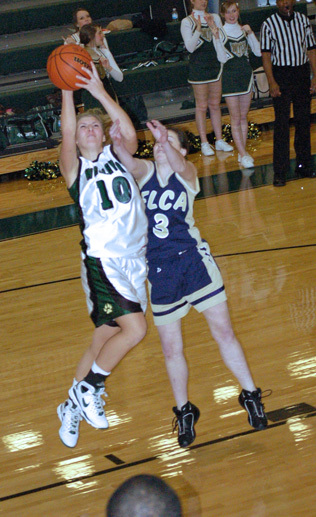 Dana earned First Team All State honors after that 2000-2001 season and finished her career with 1,366 points which ranks fourth all time in school history. Since her graduation from Wesleyan in 2001, the program she helped create has flourished winning five state titles and earning another state runner up finish in the seven years since. She has much to be proud of. Congratulations Dana on receiving this special and well deserved reward! Wesleyan will next face St. Francis in a region game Tuesday night at Wesleyan. Tipoff is 6:00 PM. Apparently jet lag has a delayed affect. Two weeks after returning from Phoenix, Wesleyan played as if they just stepped off the four hour flight home from two time zones away. Though the outcome was favorable, a 73-45 win over 8th ranked Paideia, this hardly looked like the Wesleyan team that looked so sharp in wins this past weekend over Providence and Northview. After falling behind 6-2 in the early going, Wesleyan's starting five were yanked and a fresh five entered the game. This didn't seem to have much effect though as all of the Lady Wolves just didn't seem fresh in the early stages of the game. Paideia's lead grew to 11-4 before more substitutions took place. Wesleyan cut the lead to 13-12 at the end of the first quarter. Things improved somewhat in the second quarter as the Lady Wolves got into more of a rhythm offensively and built an 11-point halftime lead at 28-17. The offense opened up more in the second half and the defense had its moments creating some turnoves from full court pressure that resulted in points. However for much of the night, Wesleyan's usual defensive intensity just wasn't there. It was enough to hold Paideia to only four points in the third quarter and eight in the fourth though. Fortunately, this unWesleyanlike performance didn't effect the game's outcome as the Lady Wolves cruised to the 73-45 victory despite its ugliness. After scoring one point in the first quarter, Anne Marie Armstrong got going in the subsequent three as she recorded a double-double scoring a game high 29 points while grabbing 13 rebounds. She also has six assists. Aysia McKenzie, Erin Hall and Chantel Kennedy each scored nine points for Wesleyan while Logan Morris added eight. Kennedy also had four assists and four boards. The game was the first meeting between Wesleyan and Paideia since the 2008 2A state championship game, a 79-40 Wesleyan win. These two teams could very well hook up again in the region tournament and possibly in the state tournament in March. The Lady Wolves improve to 11-3 overall with the win, 5-0 in region play. Up next is another region contest, the first ever meeting between Wesleyan and Fellowship Christian. Tipoff is 7:00 PM at Fellowship Christian. Wesleyan and Northview are located only a few miles apart as both reside along SR 141 but the two schools had never faced each other before tonight. The Lady Wolves made the most of their trip up 141 as they manhandled the Lady Titans 77-51 in first ever matchup between 1A Wesleyan and 5A Northview. Wesleyan took control early and from long distance as they canned four three pointers in the first quarter and led 21-11 at the end of one. The Lady Wolves' focus then moved to the interior in the second quarter as Northview began to focus on protecting the periphery. Anne Marie Armstrong made them pay as she scored eight points in the quarter. Wesleyan led 43-26 at halftime. Chantel Kennedy took over in the third quarter scoring eight points of her own in the period, many of hers coming from steals. Northview continued to have trouble dealing with Wesleyan's pressure in the period and Wesleyan took a 57-36 lead into the fourth. It began raining threes again in the fourth quarter as the Lady Wolves connected on four more while outscoring Northview 20-15 in the period to secure the 77-51 win. Once again Wesleyan had to earn its win from the field as they only shot 13 free throws the entire game, making nine. Meanwhile, Northview got 45% of its point total from free throws as they shot 32 on the night, making 23. Armstrong led all scorers as she put up 19 points. 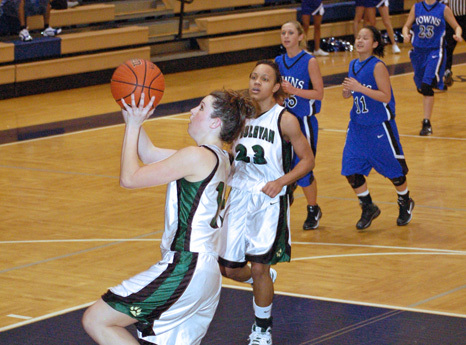 Erin Hall scored 16 points for the Lady Wolves and nailed four three pointers along the way. Kennedy barely missed a double-double as she scored 10 points, pulled down nine boards and had seven assists. Aysia McKenzie had a solid game scoring eight points while dishing five assists. Logan Morris scored eight points despite limited playing time due to foul trouble. Grace Leah Baughn added seven points for the Lady Wolves. Wesleyan improves to 10-3 on the season with the victory while Northview drops to 6-6. The Lady Wolves will return home on Tuesday night for only the third time this season as they will face Paideia in a region contest. 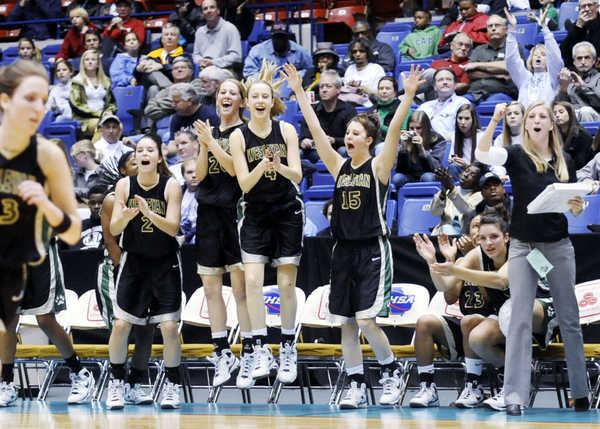 The last meeting between Wesleyan and Paideia was a 79-40 Wesleyan win in the 2A state championship game last March. Tipoff for Tuesday night's game is 6:00 PM. In their first game back after an 11 day layoff since returning from the Nike Tournament of Champions in Phoenix, Wesleyan made short work of Providence in an 87-21 win at Providence. The game was somewhat close for a quarter as the Lady Wolves led 22-11 after one quarter. Then Wesleyan's defensive pressure simply took its toll as Providence was outscored 28-7 in the second quarter. The Wesleyan lead was 50-18 at halftime. Even though Wesleyan did not apply any full court pressure in the second half, they were able to hold Providence to just three points for the half outscoring the hosts 27-1 in the third quarter and 10-2 in the shortened, six minute fourth. Every Wesleyan player played in this one as subsitutions were rampant throughout the game while mixing different player combinations. Wesleyan had three players in double-figures led by Anne Marie Armstrong's 22 points. She also dished seven assists. Erin Hall scored 18 while Kennington Groff added 12. Chantel Kennedy scored nine points and had a whopping 13 steals as she was literally all over the court tonight. Nearly every Wesleyan player scored in this 66-point win. This was the first meeting between the two schools since 2006. Wesleyan's win is its 15th straight over Providence dating back to 2000. The Lady Wolves are now 9-3 overall, 4-0 in region. Providence falls to 7-5, 1-1. Wesleyan will next face Northview tomorrow night at 6:00 PM at Northview. DULUTH - Andy Landers made a recruiting stop at Wesleyan a few months ago with plans on securing star senior guard Anne Marie Armstrong. He signed Armstrong, who was already a Georgia commitment, to a scholarship but also found another player to help his women's basketball team immediately. Landers told Wesleyan coach Jan Azar about his low number of players, so she suggested two of her former players who were already in school at Georgia, Ali Watt and Kelly Hall. Hall, a cheerleader for the Bulldogs, didn't join the basketball team, but Watt, despite a two-year plus layoff from hoops, liked the idea. "I kind of took it lightly, didn't take it too seriously at first," Watt said. "Then (Landers) called and asked to set up a meeting. So we did that and here I am." "We needed help and (Watt) answered the call," said Landers, one of the nation's winningest college basketball coaches. "She's come out and really been an asset for us." 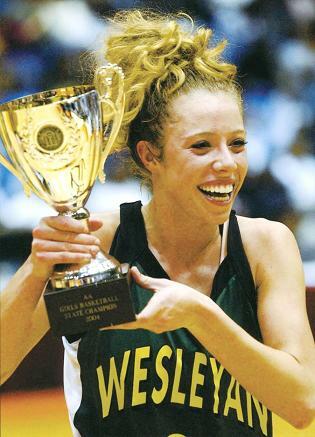 The past few months capped an improbable journey for Watt, who had given up basketball when she helped Wesleyan to the last of three straight state championships in 2006. 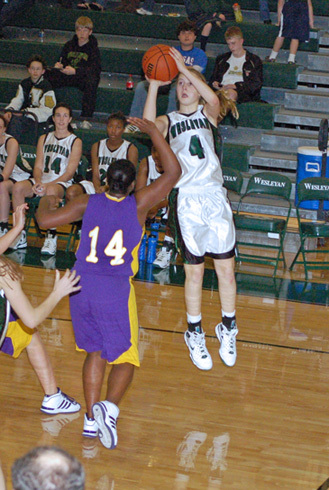 A good-shooting guard with size at 5-foot-10, she had options to play college basketball at smaller schools. But she told Azar after her junior year that she wasn't interested, opting to enroll at UGA. She was the only member of her accomplished senior class - that also included Carolyn and Elise Whitney, Le Le LeSeur and Amaris Wilson - not to play college basketball. At least until this season. "Ali's a very good player," Azar said. "She just didn't want to play in college." Basketball left Watt's life after high school and was replaced by a modeling career to earn extra money. She began as a model for Seven Jeans during her senior year of high school and also did some other projects that kept her busy up until Landers came calling back in October. "I've gotten some heat for (the modeling work)," Watt said. "It's definitely a completely different transition. In modeling, they don't want you to run, just walk. They want you to have this lean figure. It's definitely not basketball." Watt, a junior, had a rough start to 2008 for a number of reasons, including the passing of a close friend. She admitted that not much was going right, but was pleased when things started looking up in a matter of days. One of those events was a call from Landers that brought basketball back into her life. She watched the Bulldogs practice and decided to take the chance. "It didn't look that hard when I watched practice," Watt said. "Then once you get into it, it's tough. I hadn't lifted. I hadn't done anything in 21⁄2 years. So the first two weeks were pretty horrible. I've never been so sore. It was just awful." The Georgia coaches praised Watt's ability to pick up the team's X's and O's. She just needed some time to get back in shape. "First of all, it was tough for her because she hadn't played in a couple of years," Landers said. "She was in terrible shape. She would have had trouble running to the mailbox and back. But now she's gotten in shape. And she has a good understanding of the game. She's played in big games at Wesleyan, important games for important things. "Probably the best thing I can say about her is she understands how important possessions and games and turnovers and all those things really are. When she plays, she tries to play in a way where she doesn't make mistakes and tries to do positive things." Those first practices were brutal for Watt. She wasn't in basketball shape, but was practicing and going through conditioning with SEC-level athletes who train year-round. It took time to get to their level physically. "I did question (walking on) a little bit," Watt said. "It was extremely difficult, one of the toughest things I've done. But I had the support of my family and a lot of my friends who played, like Nikki Luckhurst. They kept on pushing me, telling me it was going to be worth it. And it has been." Watt understands that she isn't one of the Bulldogs' key players, so she focuses on working hard in practice and helping the other players get ready. Most of her benefit to the 9-3 team comes in those practices, although she gets a reward every now and then by playing in a game. She typically plays only in blowouts, but has seen action in six games for a total of 24 minutes. Her longest stint of eight minutes Nov. 26 against North Carolina Central was highlighted by her first, and so far only, basket. Landers said the team and fans went crazy over the shot, one that Watt will always remember. "That was very surreal," Watt said. "I could hear my mom and my friends screaming. Coach Landers told me after the game that I was the only player he knew that smiled on the court after they made their first basket." The grin was with good reason from a player who thought she had made her final basket long ago. A week of stiff competition at the Nike Tournament of Champions ended with a solid 65-53 win over HD Woodson out of Washington, DC. The win gives Wesleyan a seventh place finish in the 16-team event. Unlike in its first three games of the tournament, Wesleyan got out of the gates early opening up an 18-7 lead to start the game. The Lady Wolves led 21-10 at the end of the first quarter. Wesleyan continued its aggressive offensive play building a 27-12 lead with 3:08 to go in the half. Just when it appeared Wesleyan might pull away, the turnover bug reared its ugly head. HD Woodson took advantage of Wesleyan turnovers and went on an 8-0 run to close the gap to 27-20. Wesleyan led 29-20 at halftime. HD Woodson began the third quarter on a 7-3 run to close the Lady Wolves' lead to just 32-27 at the 4:13 mark of the quarter. That was just a little too close for comfort as Wesleyan took better care of the ball and went on its own 16-7 run to open a 48-34 lead heading into the fourth quarter. The Lady Wolves' lead grew to a 16-point margin at 52-36 with 6:46 to go in the game. HD Woodson, ranked No. 8 in the country by USA Today and No. 12 by ESPN in the pre-season, would not go quietly as they mounted a 12-6 run to cut the lead to 58-48 with 1:55 to play. They could get no closer than 10 however. The play was rough and physical but Wesleyan didn't flinch and as they pulled out the 65-53 win. Anne Marie Armstrong was spectacular scoring 36 points, the second largest scoring output of her stellar high school career. 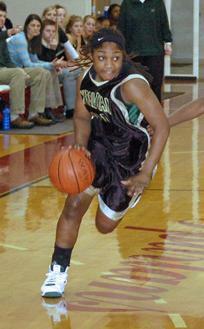 She scored 40 against Savannah Christian in the semi-finals of the 2008 AA state tournament. Kennington Groff completed an outstaning tournament scoring 10 points for Wesleyan. Logan Morris added seven points. With the win, the Lady Wolves improve to 8-3 on the season and complete the tournament with a seventh place finish and a 2-2 record against the best teams in America. The Lady Wolves more than held their own in the Nike TOC showing that they definitely were worthy of the invitation to participate in this prestegious event. To recap, Wesleyan defeated Brea Olinda from Los Angeles 49-41 in the first round. Brea Olinda was ranked No. 26 in ESPN's pre-season Top 50. They then faced Regis Jesuit from Denver, ranked No. 6 in the nation in ESPN's Top 50. Regis Jesuit came out on top in that one 62-51. Wesleyan then faced ESPN and USA Today's pre-season No. 1 St. Mary's from San Francisco. After keeping it close for a half, St. Mary's pulled away for an 82-61 win. The Lady Wolves got back in the win column today with a solid 65-53 win over Washington, DC's HD Woodson, ranked No. 8 in ESPN's Top 50. Wesleyan will have the rest of today to enjoy the sites of the greater Phoenix area before flying back to Atlanta tomorrow afternoon. Congratulations Lady Wolves on a successful first trip to the Nike Tournament of Champions! This was pressure Wesleyan had never faced and it was unrelenting. St. Mary's, from the San Francisco suburb of Stockton, California, applied a suffocating full court press from the opening tipoff until the game's conclusion and it paid off by way of a 82-61 win on the third day of competition in the Nike Tournament of Champions in Phoenix. St. Mary's pressure was very effective causing numerous Wesleyan turnovers. As has been the case in each of their previous two games in the Nike TOC, Wesleyan was slow getting out of the gate and had to play catch up. St. Mary's, ranked No. 1 in the nation in both the USA Today and ESPN pre-season polls, led 10-2 early. The Lady Wolves then went on an 10-4 run to cut the lead to 14-12. They continued to hold their own as St. Mary's led 19-16 at the end of the first quarter. St. Mary's busted out on a 13-1 run to open the second quarter to open a 32-17 lead. The teams played evenly in the latter part of the second quarter as St. Mary's took a 46-30 lead into halftime. Wesleyan went on its own 14-8 run to open the third quarter to cut the lead to 54-44. St. Mary's however, was simply too fast and could score very quickly and in spurts. They countered Wesleyan's run with a 11-2 run of their own and took a 65-46 lead into the fourth. The teams played evenly in the fourth but the damage was done. The play was rough and much freedom was granted. The brightest spot of the game was the play of Logan Morris. She scored a career high 18 points in a superb effort. Erin Hall scored 11 points for Wesleyan while Chantel Kennedy added 10. Anne Marie Armstrong had another tough night as spent much of the game in foul trouble and eventually fouled out with seven points. The game was physical and the opponent was really good. They were obviously ranked No. 1 in the country for good reason. Wesleyan has nothing to hang their heads about in this one and can use this game as a learning tool in how to handle very quick players who apply heavy defensive pressure. With the loss, they Lady Wolves drop to 7-3 on the year. Wesleyan will next face H.D. Woodson from Washington, DC on Monday at 12:30 PM in the game to determine 7th place in the 16-team field. Holding off a team featuring seven Division I signees and six players over six feet proved to be too tall a task for Wesleyan as they fell 63-52 to Regis Jesuit of Aurora, Colorado, a suburb of Denver. The teams traded blows early on and were knotted at 10 until Regis, ranked No. 6 nationally by ESPN went on a 6-0 run to increase its lead to 16-10. Wesleyan then went on it's own 7-4 run to close the gap to 20-17. In a game that featured quite a few mini-runs, Regis regained momentum and pushed the lead to nine which was aided by foul trouble on the Wesleyan end. Anne Marie Armstrong and Chantel Kennedy were both relegated to the bench late in the first half. Still ,Wesleyan fought back and closed the gap to three as Regis led 33-30 at the half. With Armstrong, Kennedy and Erin Hall sporting three fouls each, Regis was able to increase its lead back to nine going on a 14-8 run to open the second half taking a 47-38 lead. Wesleyan battled the entire second half closing the gap to 57-50 with just over a minute remaining but simply didn't have enough left and had to foul late. The biggest differnce in the game was the size advantage possessed by Regis. Their superior height enabled them to enjoy regin on the boards and keep plays alive. Despite the outcome, Wesleyan actually played much better in this game than in the first round win over Brea Olinda. The Lady Wolves were in the game the entire way and sustained numerous attempts by Regis to pull away. A few bounces Wesleyan's way and the outcome might have been different. Erin Hall continued where she left off from the second half of yesterday's game as she scored a team high 21 points. Anne Marie Armstrong added 11 while being blanketed all night by Regis double teams. Kennington Groff did an outstanding job defensively as she held Regis' star point guard Mariah Williams, a UCLA commit, to nine points. 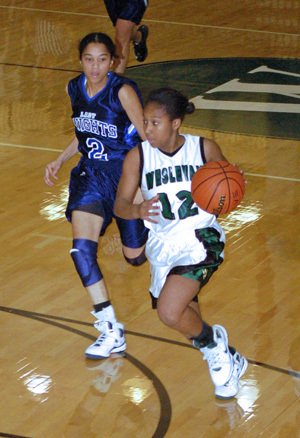 Aysia McKenzie had five assists for the Lady Wolves. Wesleyan falls to 7-2 with the loss and will now face St. Mary's from Stockton, California which is in the San Francisco Bay area. St. Mary's was ranked No. 1 in the nation in both the USA Today and ESPN pre-season polls. St. Mary's lost its quarterfinal game to Cardinal O'Hara (PA) which shows just how tough this tournament field is. Neither of the only two teams to have been ranked No. 1 in the nation so far this season, St. Mary's and Long Beach Poly, from Long Beach, California, have advanced to the semi-finals. Tipoff with St. Mary's is 3:30 PM. The question of whether the Lady Wolves belonged in the most prestegious high school tournament in the United States was answered Thursday night. Wesleyan defeated Brea Olinda from Brea, California, a suburb of Los Angeles, 49-41 in the first round of the Nike Tournament of Champions in Phoenix, Arizona. Brea Olinda, ranked No. 26 in ESPN's pre-season Top 50, jumped out to an early 20-11 lead as the Lady Wolves appeared to still be jet lagged from the 4 1/2 hour flight from Atlanta yesterday. That coupled with a post-exams hangover and stiff competiton from one of California's and the nation's top ranked teams, took an early toll. Wesleyan went on a 10-3 run to close the first half and cut Brea Olinda's lead to 24-21 at half time. Anne Marie Armstrong did most of the first half offensive damage for Wesleyan as she scored 17 of the team's 21 points. Adjustments were made at the break and the Lady Wolves were out of their fog as Erin Hall opened the third quarter with back to back three pointers. With the game tied at 31, Wesleyan closed the third quarter on a 6-2 run to take a 37-33 lead into the fourth quarter of this low scoring defensive battle. Wesleyan's lead increased to as much as 12 late in the fourth quarter before free throws narrowed the score to the final 49-41 margin. 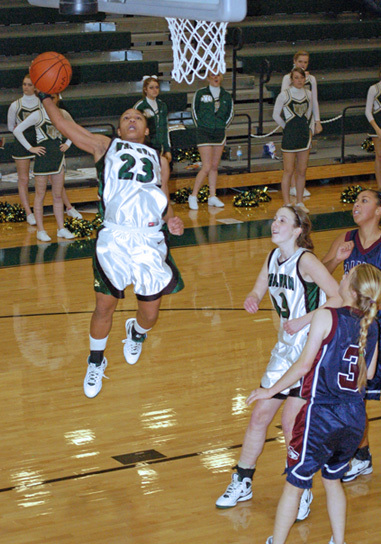 Armstrong led the way for the Lady Wolves as she scored 22 points. After a tough first half, sharp shooting Hall got on track in the second as she connected on four three pointers and finished with 14 points. With the win, Wesleyan improves to 7-1 on the season. They will next face a very tough assignment in Regis Jesuit from Aurora, Colorado in the quarterfinals. Regis Jesuit, ranked No. 6 in the country in the ESPN pre-season Top 50, defeated Bishop McGuinness from Kennersville, North Carolina, ranked No. 12 in the ESPN poll, earlier in the day to advance to the quarterfinals. Regis Jesuit features seven players who have signed Division I basketball scholarships so this should be interesting. Tipoff is 5:00 PM. Erin Hall connected on four three pointers as Wesleyan dismantled Eagle's Landing Christian 82-28 Friday night in a Region 7-A contest at Wesleyan. Tonight was Lower School Night and the Lady Wolves did not disappoint, especially in the first quarter as they rolled up 31 points which set the tone for a long night for the visiting Chargers of ELCA. Wesleyan outscored ELCA 31-10 in the first quarter and 15-7 in the second to take a 46-17 lead at halftime. During halftime, boys and girls in Wesleyan's Lower School performed various dribbling drills set to music and were greeted by appreciative applause from the crowd. The second half wasn't too different from the first as the Lady Wolves outscored ELCA 18-5 in the third quarter and 18-6 in the fourth, allowing a total of 11 second half points. Everyone saw plenty of playing time in this one. Hall led all scorers with 20 points followed by 18 by Anne Marie Armstrong. Nyaa Davis added 11 points for Wesleyan while Holli Wilkins chipped in eight. Wesleyan handed ELCA (5-1) its first loss of the season while winning its fifth straight game. The Lady Wolves are now 6-1 on the year, 3-0 in region as they prepare to fly out West on Wednesday. Wesleyan will be participating in the prestegious Nike Tournament of Champions in Phoenix which is being held December 18-22. The Lady Wolves, ranked No. 22 nationally by ESPN will face Brea Olinda (CA), ranked No. 29 nationally by ESPN, in the first round. Tipoff is Thursday, December 18 at 4:30 PM Mountain Time/6:30 PM Eastern Time. Wesleyan travelled to Greenforest Tuesday night and picked up a 96-26 region win. 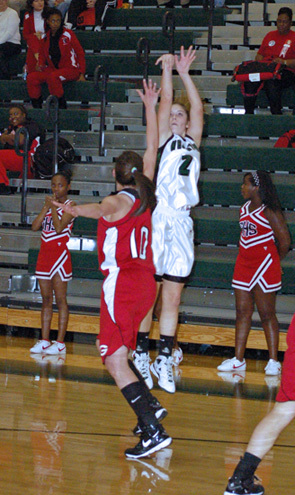 Four Lady Wolves scored in double figures led by Anne Marie Armstrong's game high 26 points. 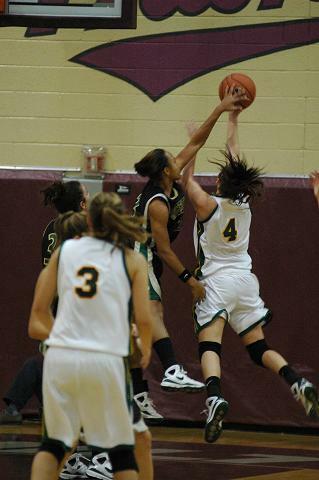 She also had 10 rebounds, five assists, four steals and three blocked shots. Erin Hall hit three three-pointers on her way to 15 points, four assists, three steals and five boards. Chantel Kennedy added 14 points, five steals and four rebounds while Grace Leah Baughn chipped in 12 points. Rounding out Wesleyan's scoring effort are Kennington Groff who put up nine points, Logan Morris and Nyaa Davis who scored six points apiece and Aysia McKenzie and Holli Wilkins who added four points each. 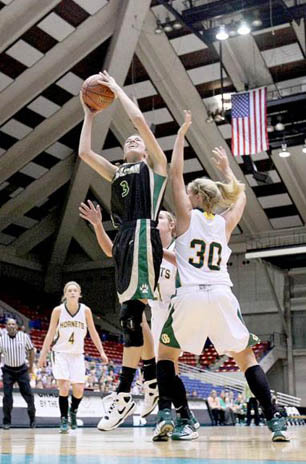 Genefine Sapatch led Greenforest's scoring effort with 17 points. With the win, the Lady Wolves improve to 5-1 overall, 2-0 in region. Wesleyan's final game before heading to Phoenix will be on Friday as they take on region opponent Eagle's Landing Christian. Anne Marie Armstrong had the second highest scoring output of her career as Wesleyan defeated Butler (NC) 69-61 tonight in the Peachstate Battle of the Southeast at Wesleyan. The 2nd Annual Peachstate Battle matched up some of the best teams in metro Atlanta against some of the best teams from all over the Southeast and the Wesleyan/Butler match up was the premier and final game of the day. The game lived up to its primetime time slot as many Division I college prospects were on display between Wesleyan, ranked No. 7 in the Southeast by ESPN and Butler, ranked No. 15 in the Southeast by ESPN. Things appeared rather bleak for the first few minutes of the game as Butler opened an 8-0 lead before Wesleyan finally got on the scoreboard about four minutes into the game. Butler’s lead came mainly from three three-pointers in the quarter from its standout guards Celeste Stewart, an East Carolina signee and Jaquaria Forney, a North Carolina-Charlotte signee. Despite being down eight early, the Lady Wolves fought back behind the strength of two threes by Armstrong and cut the lead to 18-15 in favor of Butler at the end of the first quarter. Wesleyan changed things up on the defensive end in the second quarter which resulted in Butler only scoring nine points in the period compared to the Lady Wolves’ 18. Wesleyan led 33-27 at the half. Butler kept things close though as the teams battled in the third quarter, Wesleyan outscoring Butler 22-19 in the period to take a 55-46 lead into the fourth. Numerous times in the fourth quarter, Butler was able to trim the lead to four points but every time they did, Wesleyan would counter and the lead would creep back up to eight or nine. In order to try to gain possession, Butler had to foul but Wesleyan made them pay as the team was 10 for 12 from the free throw line in the fourth quarter. In handing Butler its first loss of the season, there were certain key areas where Wesleyan excelled, free throws and turnovers. The Lady Wolves shot 83% for the game from the free throw line going 15 for 18 from the line as a team. Wesleyan also did a good job in the turnover department. While Butler’s press caused a couple of Wesleyan turnovers, the Lady Wolves broke Butler’s press with ease much of the time. Wesleyan also took care of the ball in the half court. This Butler team is highly regarded in North Carolina as they have two seniors, Stewart and Forney , who combined for 48 points and will be playing Division I basketball next year. Then there is 6’4 junior center Clair Watkins who already has scholarship offers from Clemson, Duke and West Virginia. Butler was also the beneficiary of three prominent transfers, Forney, 6’3 sophomore Cierra Burdick, who is one of the nations top recruits in her class and 5’11 Quay Barrino. With Butler's returning players from last year’s 26-4 North Carolina Class 4A final four team and the addition of the transfers, many Charlotte area coaches believe that this team has six high major Division I recruits. Having said that, the better team won tonight. Wesleyan weathered Butler’s early storm and were not intimidated by their bigger and athletic opponent. It’s worth noting that once the Lady Wolves seized the lead in the second quarter, they never relinquished it. Wesleyan’s performance tonight validates its national and regional rankings. 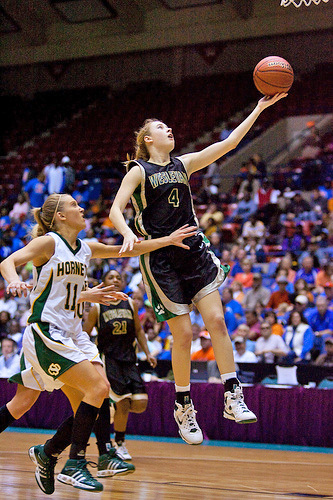 Armstrong led all scorers as she scored 35 points which is the second most of her career to the 40 points she scored in the 2008 Class 2A semi-finals against Savannah Christian. She seemed to be everywhere tonight and had a simply tremendous all around game. Grace Leah Baughn scored nine points prior to fouling out in the fourth quarter. Erin Hall, Logan Morris and Aysia McKenzie scored six points each while Chantel Kennedy chipped in three. Kiersten White and Holli Wilkins rounded out Wesleyan’s offensive output adding two points apiece. For Butler, Forney and Stewart did the most damage scoring 25 and 23 points respectively. This game was fantastic preparation for the level of competition the Lady Wolves will face in the Nike Tournament of Champions in Phoenix two weeks from now. With the win, Wesleyan improves to 4-1 on the season. Up next is a region game at Greenforest on Tuesday. Tipoff is 6PM. The last time these two teams met, Wesleyan's freshmen would have been three years old. That's how long it's been. Wesleyan last played WD Mohammed on January 9, 1998 in Wesleyan's first year of varsity competition. WD Mohammed got the best of the Lady Wolves in both meetings that inaugural season winning the first meeting 64-37 on December 12, 1997. The two met again a month later and that very first Wesleyan varsity team showed improvment as they fell 36-27. 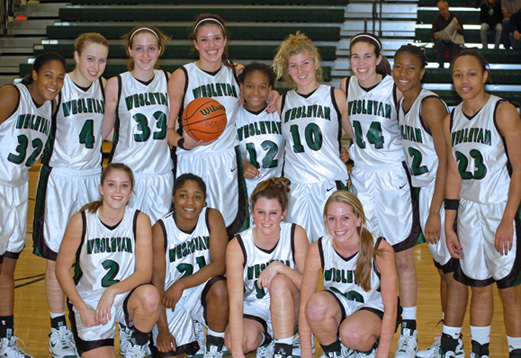 The Inaugural Lady Wolves finished 4-16 that 1997-1998 season, the first and only losing season in Wesleyan history. 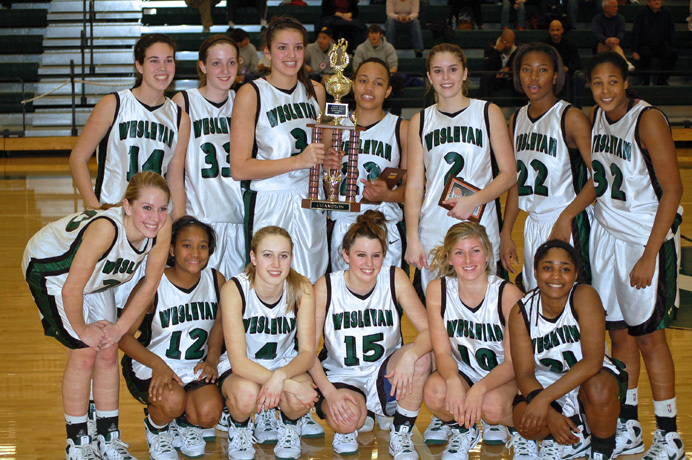 A lot has changed for Wesleyan since then as the school has grown as has the girls basketball program. After six years in Class 2A and four 2A state titles and one state runner up finish, Wesleyan has been placed in Class 1A after the GHSA eliminated the 1.5 private school enrollment multiplier. Tonight's meeting with WD Mohammed is the Lady Wolves' first region game of the season. Wesleyan did not disappoint as they rolled to an 83-7 road win. All Wesleyan players scored in this one as everyone saw playing time. The Lady Wolves led 64-3 at the half behind a 40-point second quarter, which might be a team record. The scoring output for Wesleyan went as follows: Anne Marie Armstrong, 22, Erin Hall, 10, Chantel Kennedy, 9, Kiersten White, 8, Aysia McKenzie, 6, Hayley Hughes, 6, Grace Leah Baughn, 6, Grace Cowart, 4, Kennington Groff, 4, Logan Morris, 4, and Holli Wilkins, 4. With the win, Wesleyan improves to 3-1 overall, 1-0 in region. Up next will be a somewhat of different contest as the Lady Wolves will take on powerhouse Butler High School of Charlotte, North Carolina. Butler posseses a team loaded with Division I singees and prospects and is coming off of a 26-4 2007-2008 campaign. This will be the final game of the Peachstate Battle of the Southeast which is an all-day event being held at Wesleyan and features games between local teams and teams from all over the Southeast. Tipoff for the Wesleyan/Butler game is 5:00 PM Saturday. At some point the light will come on for Wesleyan this season but so far the team as been somewhat in the dark. The Lady Wolves again put in a performance that was not up to their standards as they defeated Class 3A No. 10 ranked Loganville 49-47 Tuesday afternoon in the Third Place game of the Parkview Holiday Classic. The teams battled to an 11-11 tie at the end of the first quarter behind Anne Marie Armstrong's eight first quarter points. Armstrong was whistled for three fouls in the first half though and had to sit much of the second quarter. Holli Wilkins took up the slack in the interior as she scored six points in the second quarter to help Wesleyan take a 27-20 lead into halftime. The Lady Wolves appeared to be breaking the game open as they started the third quarter on an 8-2 run to take a 35-22 lead but Loganville closed with a 12-3 run of its own and Wesleyan led only 38-34 going into the fourth quarter in an uncharacteristicly low scoring game. Loganville cut the lead to two but that's as close as they would get as Wesleyan held on for the 49-47 win. Armstrong led all scorers with 13 points while Wilkins scored nine. Logan Morris added eight points as Chantel Kennedy and Aysia McKenzie chipped in six points apiece. Wesleyan improves to 2-1 on the season with the win and will now have a week off to enjoy the Thanksgiving holidays. Hopefully that will be the break they need to get back to playing the type of basketball they're capable of playing. They will next hit the road to face W.D. Mohammed next Tuesday in their first region game of the sesaon. Tipoff is 5:30 PM. Logan Morris defends. Morris scored Wesleyan's first four points of the game. Wesleyan came out punchless against a new look, talented Norcross team and was handed a 70-56 loss in the semi-finals of the Parkview Holiday Classic Monday afternoon. The game had a 3PM start but the way Wesleyan played in the first half, one would have thought it was 3AM. The Lady Wolves appeared to sleepwalk through the early stages of the game as Class 5A No. 8 Norcross built a 34-22 halftime lead courtesy of an uninspired defensive effort by Wesleyan and an apparent lifting of the requirement for the ball handler's pivot foot to remain stationary. Wesleyan looked more like the team we've come to know in the third quarter as they played solid full court defense and were able to force some turnovers. Anne Marie Armstrong got on a roll hitting three consecutive three pointers at one point and Wesleyan gave themselves a chance outscoring Norcross 22-16 in the quarter. Norcross led 51-44 heading into the fourth. Unfortunately Wesleyan ran out of steam and opportunities in the final period as Norcross wore a path to the free throw line. All told Wesleyan was whistled for 24 fouls for the game compared to eight for Norcross. As a result Norcross shot 27 free throws during the game while Wesleyan shot three...yes, three free throws... The Blue Devils were 18 for 27 from the line while Wesleyan was 1 for 3. Norcross' 17-point advantage from the free throw line was a significant factor in the game. Armstrong led the scoring for Wesleyan as she had 22 points...20 of which were scored in the second half. Grace Leah Baughn added 12 points for Wesleyan while Erin Hall chipped in nine. Wesleyan falls to 1-1 on the season and will next face Loganville in the Third Place game tomorrow at 4:00 PM. 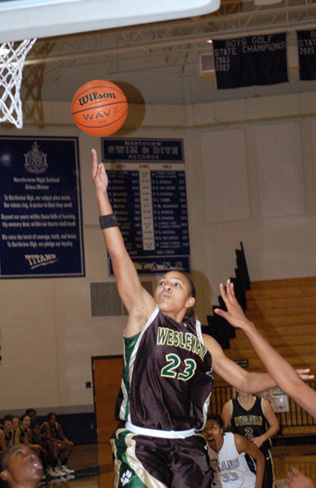 Wesleyan began the 2008-2009 season with a bang Saturday afternoon as they trounced Class 4A Miller Grove 72-35 in the first round of the Parkview Tip-Off Classic. The Lady Wolves set the tone early as they raced to a 25-4 lead at the end of the first quarter. The defense caused many turnovers and miscues by Miller Grove in the early action. However, as good as Wesleyan’s defense was in the first quarter, it was equally porous in the second as Miller Grove outscored the Lady Wolves 17-16 in the period. Wesleyan took a 41-21 lead into halftime. Whatever was said at halftime worked as the Lady Wolves locked in on defense and dominated the third quarter in the same manner as they did the first. A 20 point halftime lead turned into a 40 point lead going into the fourth quarter as Wesleyan blew the game open outscoring Miller Grove 23-3 in the third to take a 64-24 lead into the fourth. The scoring for the Lady Wolves was balanced as Anne Marie Armstrong led the way with 18 points. Erin Hall scored 15 points while Grace Leah Baughn and Kennington Groff put up nine points apiece. Chantel Kennedy and Aysia McKenzie added seven points each for Wesleyan. With the win, Wesleyan is 1-0 on the season and will face Norcross, ranked eighth in Class 5A, in the semi-finals. Norcross defeated Sandy Creek 60-48 in its first round game. Tipoff is 3:00 Monday at Parkview. More national recognition has come Wesleyan's way as USA Today recently released its pre-season Super 25 national rankings. The Lady Wolves are ranked No. 9 in the country in the USA Today poll. This goes with their No. 22 national ranking in the ESPN poll. Wesleyan is the only team from Georgia in the USA Today national rankings. USA Today also has a regional Top 10 poll. The Lady Wolves are ranked No. 3 in the South in that one. Click on this think to see the write ups about each team in the Super 25. http://www.usatoday.com/sports/preps/basketball/poll/2008-09-super25w.htm On the left is Super 25 national poll and below is the regional poll listing the top 10 in the South. A day after helping Wesleyan thrash Class 5A No. 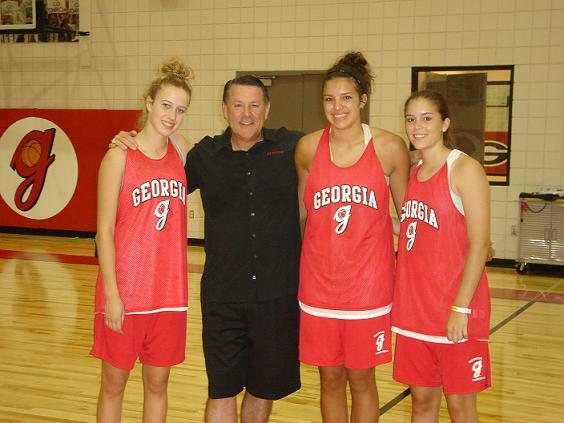 3 ranked Duluth by 35 points in a pre-season scrimmage, seniors Anne Marie Armstrong and Chantel Kennedy signed their letters of intent with the University of Georgia and Colorado State University respectively. In a ceremony held in Chapman Library on the Wesleyan campus Wednesday, the two teammates and best friends were surrounded by their fellow teammates, family members, coaches, faculty and other students who were in attendence to witness the event. Anne Marie becomes the first Wesleyan player to sign a basketball scholarship with an SEC school while Chantel is the first to sign with a school from the Mountain West conference. Congratulations to Anne Marie and Chantel for these remarkable achievements! The Wesleyan Lady Wolves have had much success over the past few years.... numerous state championships, region championships, holiday tournament championships, lots of All State players, a few NCCAA All Americans and a Miss Georgia Basketball award winner. But for all of this success and recognition, the Lady Wolves have never been ranked nationally. All of that has changed as ESPN has Wesleyan ranked No. 22 in its pre-season high school girls basketball poll. Thirteen of the 16 teams participating in the Black Division of the Nike Tournament of Champions in Phoenix are ranked in this poll. To be considered among the elite of the thousands of high school teams across the country is a rare and tremendous honor. Click on this link to go to ESPN's site to read about each team in the poll. 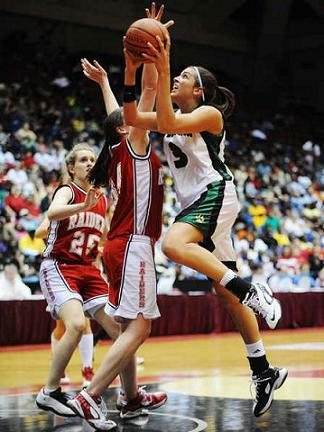 http://sports.espn.go.com/highschool/rise/basketball/girls/news/story?id=3683105. The ESPN Top 50 is listed below. Wesleyan senior Chantel Kennedy has decided to continue her education and basektball career at Colorado State University. She gave the school a verbal committment late last week after considering scholarship offers from College of Charleston, Wofford and Kennesaw State among others. The 5-foot-7 senior averaged 7.0 points, 3.8 steals and 5.0 rebounds last season as Wesleyan went 30-3 and won the Class AA state title. "Chantel is our best defensive player and has really stepped up her game offensively over the past year," Wesleyan coach Jan Azar said. "She is a great leader and should really stand out as one of the best players in the state this year. I'm very excited for her to continue her basketball career at Colorado State." Colorado State is a member of the Mountain West Conference whose members include Air Force, Brigham Young, Nevada-Las Vegas, New Mexico, San Diego State, Texas Christian, Utah and Wyoming. The Rams are in rebuilding mode after a 2007-2008 campaign where the team endured a tough 4-28 record. But the outlook is encouraging led by recently hired head coach Kristan Holt. Colorado State has an all-time winning record and qualified for the NCAA Tournament as recently as 2002. The addition of Chantel can only make the program stronger as they will be inheriting a hard working, coachable, talented player. The rest of us back East will be envious as Chantel is enjoying life in the wild blue yonder out West...beautiful mountains, open plains, fresh air! Congratulations to Chantel on her decision. The Lady Wolves have been invited to participate in the Nike Tournament of Champions in Phoenix, Arizona over the Christmas holidays. The tournament is scheduled December 17-23, 2008. The Tournament of Champions has long been considered the most competitive and prestigious high school basketball event in North America and the world. It has produced eight USA Today National Champions and 64 Divisional State Champions since 1997; hundreds of collegiate basketball stars, 29 WNBA athletes, and five U.S. Olympians played in the tournament as preps. In addition to being covered extensively by the national news media including ESPN and the USA Today, the Tournament of Champions remains the only in-season high school basketball event that attracts coaches from every major NCAA Division I women’s college basketball program for the purpose of evaluating potential scholarship athletes. More than 210 coaches attended in both 2006 and 2007. Wesleyan was selected to receive this invitation based on numerous criteria, but special consideration was given to teams likely to be among the strongest in the country or the Western States, and to teams who have shown loyalty to the event through past and continued participation. Wesleyan is one of 16 teams invited selected to compete in the Tournament of Champions prestigious Black Division. The Black Division has produced the eventual USA Today National Champions nine times in the last 11 years, and only once in the past decade has the Black Division winner not been the consensus No. 1 ranked team in the nation the week following the event. * The only other team from Georgia ever invited to this event was Collins Hill in 2006. 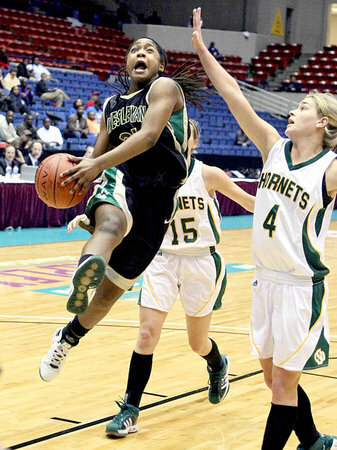 That year University of Connecticut All American Maya Moore led Collins Hill to the Tournament of Champions title and the eventual USA Today National Championship. The teams invited to participate in the Black Division are listed below. Congratulations to Coach Azar and each of the Wesleyan girls players for this unprecidented honor. This invitation was extended because the Wesleyan Lady Wolves are being recognized as possibly one of the top teams in the entire United States. This trip to Phoenix will be a truly a humbling experience and all of the coaches and players feel sincerely blessed and honored for this recognition. Wesleyan sent four teams from grades 7-12 to participate in Coach Andy Landers' annual team camp in June at the University of Georgia. This is an annual summertime trek for Wesleyan girls basketball players as they have attended team camp at Georgia numerous times. Pictured are sophomore Grace Leah Baughn, Georgia coach and soon to be Anne Marie's coach, Andy Landers, senior Anne Marie Armstrong and junior Erin Hall. Former Wesleyan star Nikki Luckhurst, class of 2004, has accepted and invitation to play for the British national team during an upcoming eight-game tour of Europe. The 16-member squad is beginning preparations for the 2012 Olympics, to be held in London. 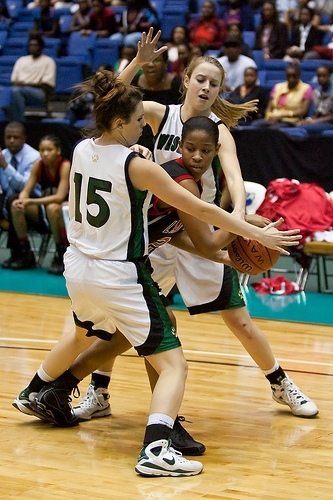 Luckhurst had just completed her senior season at Tulane when she received the invitiation. She ended her career as the university's second all-time leader in 3-pointers as well as seventh all-time in Conference USA history with 193. Luckhurst is elligible to represent Great Britain by virtue of her dual citizenship in the United States and Great Britian. Her father Mick is a British citizen. Regardless of whether she sticks with the national team, Luckhurst hopes to play overseas after the home-and-home schedule against Ukraine, Lithuania, Germany and Israel, which ends Sept. 13. I'm probably going to be playing in Spain or Australia or somewhere overseas," she said. "I'm going to talk to the girls on the team and the coaches and try to figure out the best place for me. They told me they can get me an agent over there. That's the plan right now," said Luckhurst, who led Wesleyan to state titles in 2002 and 2004. "As long as my body can hold up, I'd love to play basketball for a living." Luckhurst, Wesleyan's all-time leading scorer with 2,393 career points, said the team will train and play its home games at the Welsh Institute of Sport in Cardiff, Wales. She's been e-mailing the coach but says she doesn't know what to expect. "It should be interesting," she said. "I'm excited, but I don't really know too much about it yet." Wesleyan rising senior Anne Marie Armstrong has made a verbal commitment to continue her basketball career at the University of Georgia. Armstrong made the verbal commitment over the weekend while in Athens attending Georgia's basketball camp with her Wesleyan teammates. 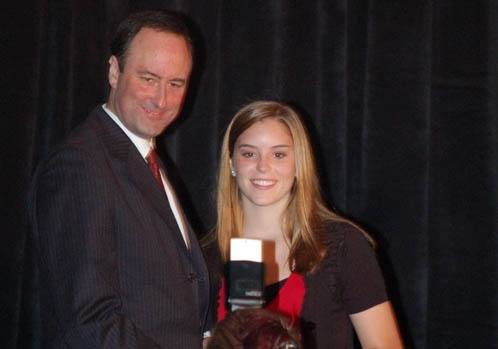 Armstrong, the reigning Miss Georgia Basketball, was quoted in the Atlanta Journal-Constitution stating "It's always been a dream of mine to play basketball at Georgia for Coach [Andy] Landers. I'd watch games on TV when I was little and decided it would be cool to play there." 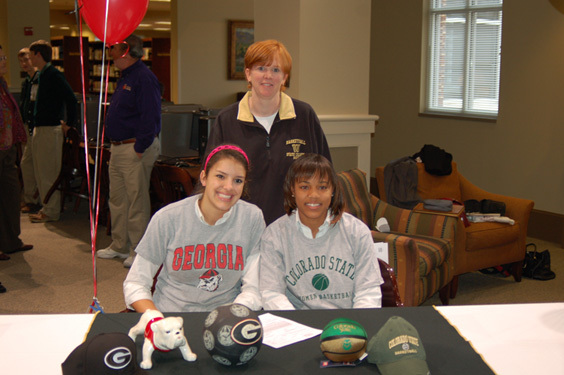 Armstrong selected Georgia after a long recruiting process that began her freshman year at Wesleyan. Among the schools recruiting her were Florida State, Wake Forest, Maryland, LSU, Duke and Georgia Tech. On selecting Georgia, Armstrong told the Gwinnett Daily Post, "I just wanted to be sure Georgia was the right choice for me," Armstrong said. "It came down to how well I got along with the players and coaches, and I liked the facilities and the school for all the social and academic stuff, too." She said Landers envisions her as a small forward, and that she hopes to make an immediate impact. When she laces up her shoes for her first college game, Armstrong will become the 10th Wesleyan player to play at the collegiate level. Congratulations to Anne Marie on her decision and the relief that comes from having made it. I'm sure she will make us all proud as she competes in the toughest conference in women's college basketball, the SEC. The Atlanta Journal-Constitution released its All State team on Sunday with Wesleyan having two representatives. Junior Anne Marie Armstrong earned First Team All State Honors while sophomore Erin Hall was named Second Team All State. 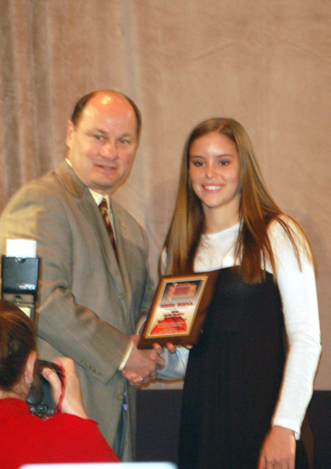 Armstrong was not named AA player of the year as she had already received the Miss Georgia Basketball award recognizing her as the most outstanding player in the state. This was Armstrong's second All State award while Hall is earning her first. Finally, Wesleyan caoch Jan Azar was named AA Coach of the Year. It is her fifth coach of the year honor. Congratulations to all three! Wesleyan junior Anne Marie Armstrong has been named National Player of the Year by the National Christian School Athletic Association. She is also a First Team All American selection. NCSAA All-Americans were chosen from among finalists, based on this season's statistics and achievements; competitive strength of team schedule; level of skill (assessed by submitted video); and other significant factors that were shared during the nomination process. Anne Marie will receive an award certificate for her accomplishment. In addition, notice of each player's selection will be sent to his/her local newspaper(s) for suggested publication. The All-American teams will be featured in an upcoming issue of Passion in Play (the NCSAA magazine), and on the NCSAA web site the list will also be published to the attention of college coaches. Each Player of the Year will be individually featured in Passion in Play and will receive an additional award plaque, to recognize his/her selection. Anne Marie becomes the first Wesleyan player to earn National Player of the Year honors. She was named Second Team All American last season making her the first Wesleyan player to earn NCSAA All America honors twice. Two other Wesleyan players have earned NCSAA All America honors. 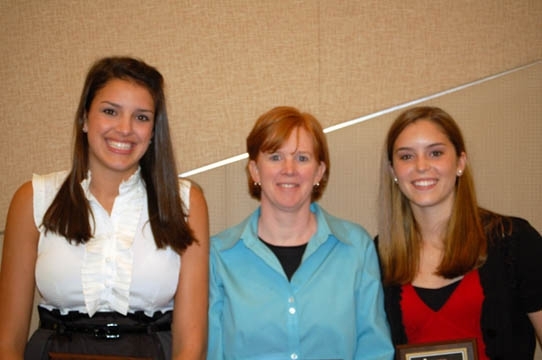 In 2004, Nikki Luckhurst was named second team All American by the NCSAA while Carolyn Whitney was named third team All American in 2006. Congratulations to Anne Marie for this amazing honor! The Georgia Athletic Coaches Association released its All State teams on May 6th and Wesleyan junior Anne Marie Armstrong was named AA North Georgia Player of the Year. She and sophomore Erin Hall were both named to the 19-person All State Team. Congrats to both Anne Marie and Erin! 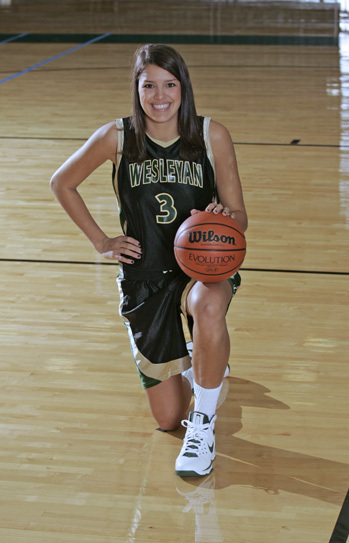 Wesleyan sophomore Erin Hall was selected as a member of the Metro Atlanta Girls Team of the Year, her first such honor. The Metro Atlanta Girls Team of the Year recognizes the most outstanding players in the far-reaching metro Atlanta area for the just completed season. Hall posted averages of 13.2 points and 2.8 assists per game and hit a whopping 72 three pointers which ranks fourth all-time on Wesleyan's list of single-season three pointers made. Her achievement was recognized at the Atlanta Tipoff Club Naismith Awards Banquet held last night at the Cobb Energy Performing Arts Centre along with the other award winners. The Metro Atlanta Girls Team of the Year honorees are listed below. Congratulations Erin on this most deserved award! The Gwinnett Tipoff Club season-end banquet was held Saturday morning at Berkmar High School and Wesleyan was well represented. Leading the way was Coach Jan Azar as she earned her fifth Gwinnet County Coach of the Year award. Junior Anne Marie Armstrong was named Gwinnett County Co-Player of the Year along with Mill Creek standout Porsha Porter. Erin Hall earned First Team All County honors while Chantel Kennedy was named All County Honorable Mention. Hayley Hughes was Wesleyan's Scholar Athlete award recipient. Carter Johnson received the Joe Marelle Award which is given anually to a Gwinnett athlete who demonstrates courage in overcoming adversity. Lastly, Wesleyan was named Team of the Year for Gwinnett. Congratulations to every member of the Wesleyan girls basketball team and the entire coaching staff and mangers for all of these accomplishments. The All County Teams are listed below. The Atlanta Journal-Constitution released its All Gwinnett County Team of the Year on Sunday and Wesleyan junior Anne Marie Armstrong was named Player of the Year for Gwinnett. The AJC's All County Team is listed below. Congratulations Anne Marie for another well deserved honor. Wesleyan junior Anne Marie Armstrong has achieved the highest individual honor a basketball player can earn in the state of Georgia as she was recently voted Miss Georgia Basketball for 2008 by the Atlanta Tipoff Club. The Miss Georgia Basketball award recipient is regarded as the most outstanding female basketball player in the state of Georgia regardless all her school's GHSA classification (1A, 2A, 3A, 4A or 5A). Armstrong earned this award behind the strength of her per-game averages of 19.2 points, 8.2 rebounds, 3.7 assists, 3.5 steals and 2.4 blocks. She also led her team to a 30-3 record, the 2A state championship and the Deep South Classic championship while defeating much larger schools that contained other potential Miss Georgia Basketball nominees on their rosters. She is the first Wesleyan player to achieve this honor and is among the few in the 24-year history of the award who did it while playing at a smaller school. She now has her name on a list of elite players in the history of Georgia high school basketball, not least among those are Christi Thomas, Sherill Baker, Tasha Humphrey and Maya Moore. Armstrong would be the first to say that this award would not have been possible without being a member of such a deep and talented (and well coached) team. She knows she's not a one-girl gang but it's simply outstanding that her talents and achievments have been recognized in form of the highest state honor that can be bestowed upon a high school basketball player. Armstrong was recognized at the Atlanta Tipoff Club Naismith Awards Banquet held last night at the Cobb Energy Performing Arts Centre. The all-time list of Miss Georgia Basketball award winners is listed below. Congratulations Anne Marie on this amazing honor!